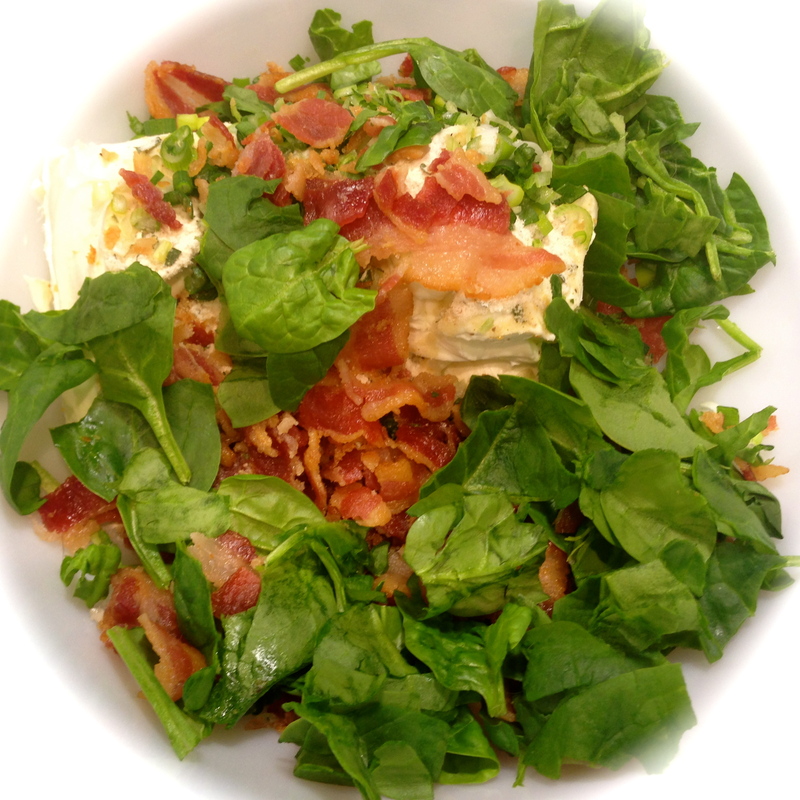 bacon – You Betcha Can Make This! Fall is just about here. I can already see the difference in the angle of the sun that brings about darkness much earlier. You can feel the change in the air. But there’s still some time to fire up the old grill and have a late Summer party with great appetizers and good ole BBQ. I’ve had a lot of practice making appetizers this Summer as my condo association hosts a happy hour every Thursday and although you’re not obligated to bring anything I like to use it as my recipe tester event. So last Thursday I made this dip and it was a hit. Lesson Learned 1: Make this as tangy as you like. In my experience light heat is the most effective when making a recipe for a crowd. You can never judge the heat quotient of your guests so it’s best to give it just a little zip to a recipe so the greater majority of people will eat it. But if you know you’ve got a group that loves spicy, feel free to add as much heat as you like. It’s all up to you. Lesson Learned 2: Used precooked bacon as a shortcut. 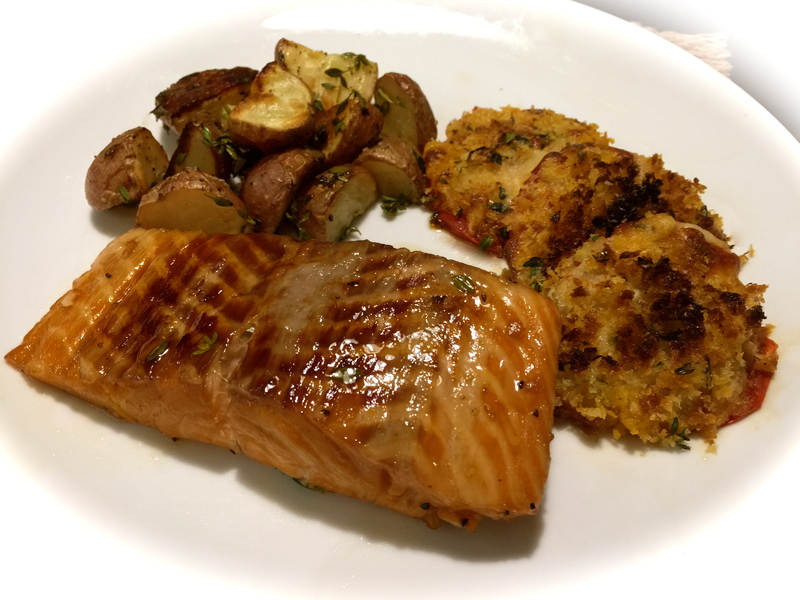 I found a package of Boar’s Head precooked bacon and I used it when I made this recipe. It is a great time saver, you eliminate the grease and mess you get cooking bacon and the flavor is just the same. So if you’re really looking to cut your prep time, try that. If not, cooking bacon the old fashioned way is perfectly fine. Lesson Learned 3: Serve this with veggie straws. I’m not sure how I got the idea to use veggie straws but they were the perfect compliment to the dip. I think people just get tired of the usual potato or nacho chips and this was a welcome change. 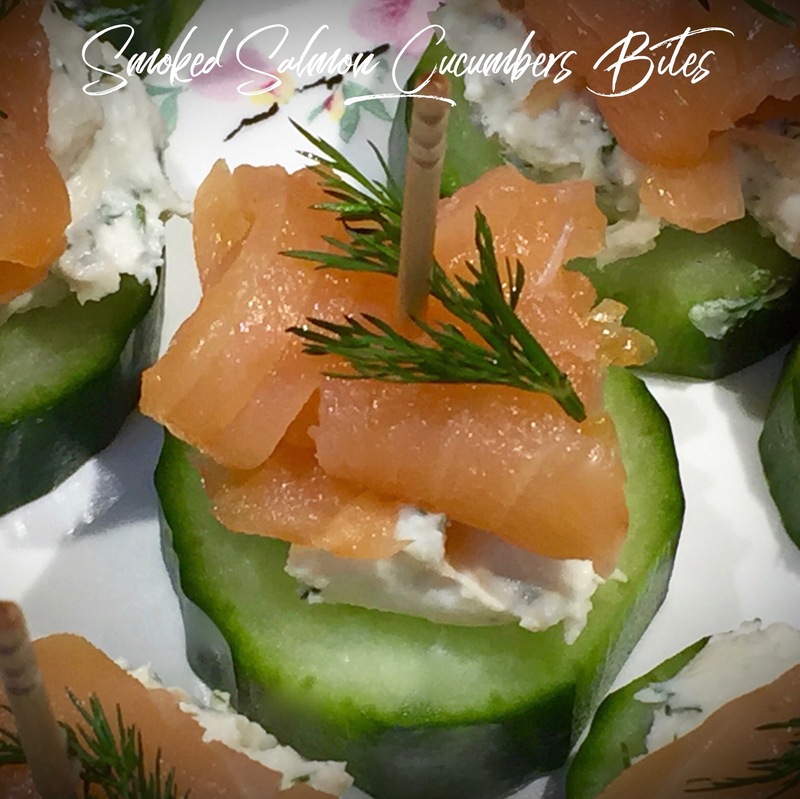 They also lend themselves well to scooping some dip on the straw which makes this appetizer great finger food. Lesson Learned 4: As with any dip, make it ahead of time. 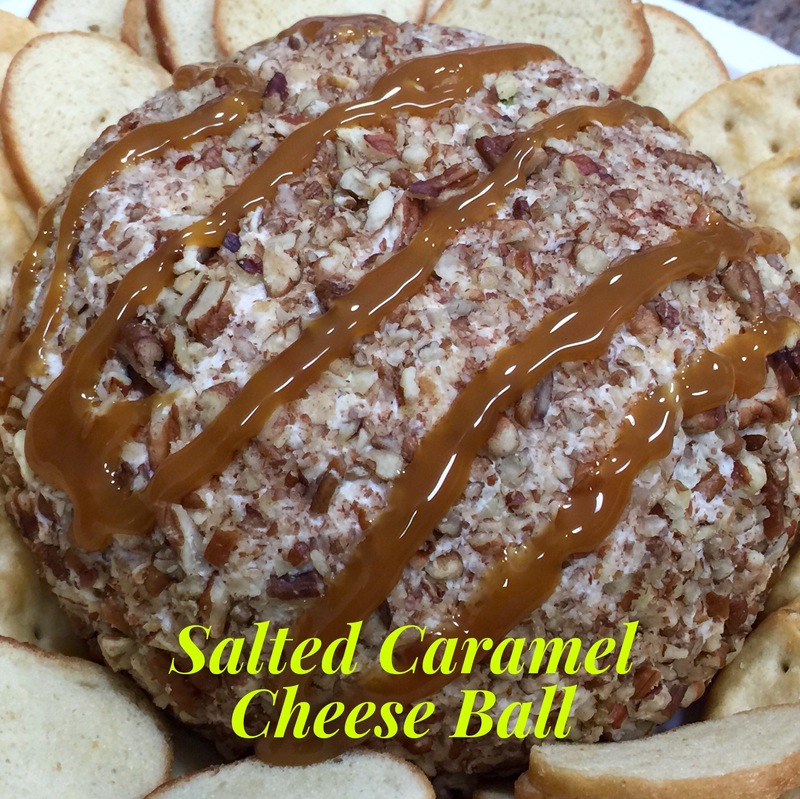 I know I’ve said this time and time again, but dips, cheese balls and the like always taste better when you give the ingredients time to get acquainted. 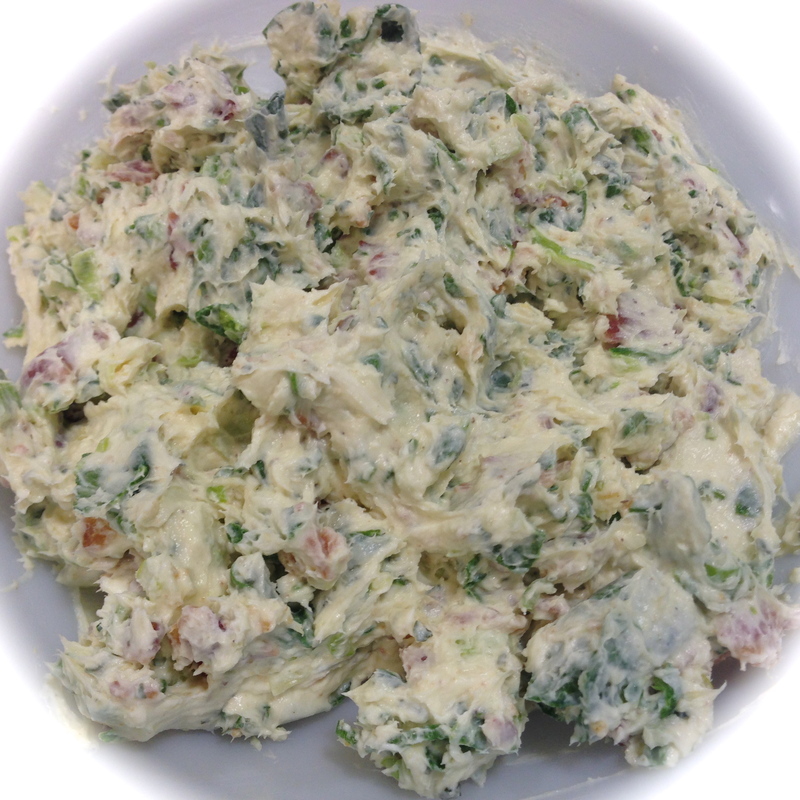 So make this dip a few hours ahead of time and let it chill in the refrigerator before serving. The dip always tastes better a few hours after its had time to chill. 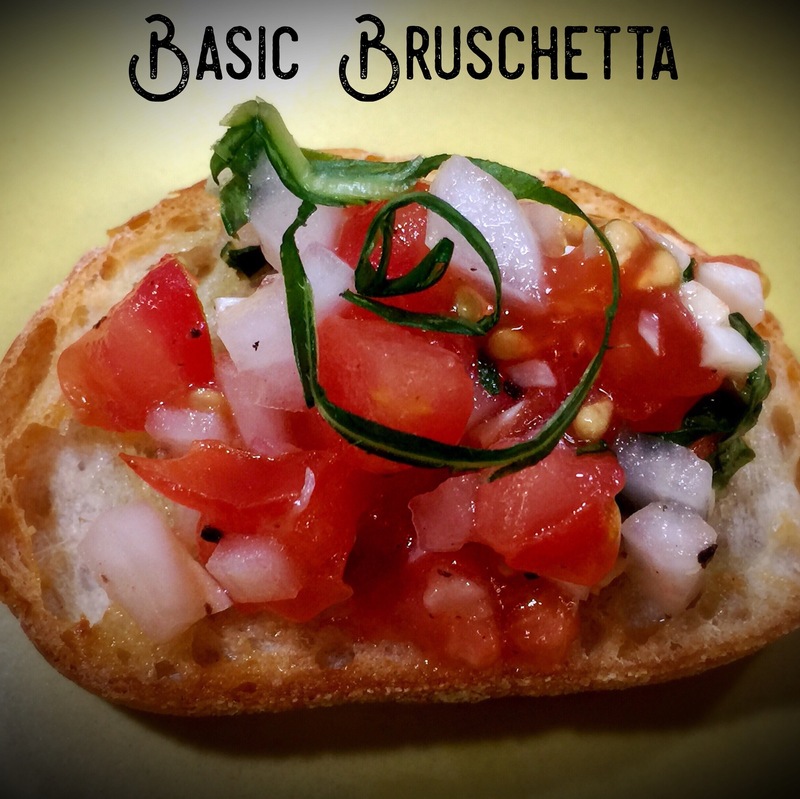 What I like about this appetizer is it’s quick and easy. You don’t have to spend a lot of time on this one and your guests will love it. Try it at your next get together. Enjoy! In a medium bowl combine yogurt, sour cream and garlic salt. Add hot sauce to taste. Stir in cheese and 1 1/2 Tbs. of chives. Add all but about 1 Tbs. of crumbled bacon. Stir to combine. Transfer the dip to a serving bowl. Cover and chill for at least 1 hour. To serve garnish with reserved bacon crumbles and chives. Serve with veggie straws. Let me say right up front that this recipe is an artery clogger. That is why I make it once or maybe twice a year tops. 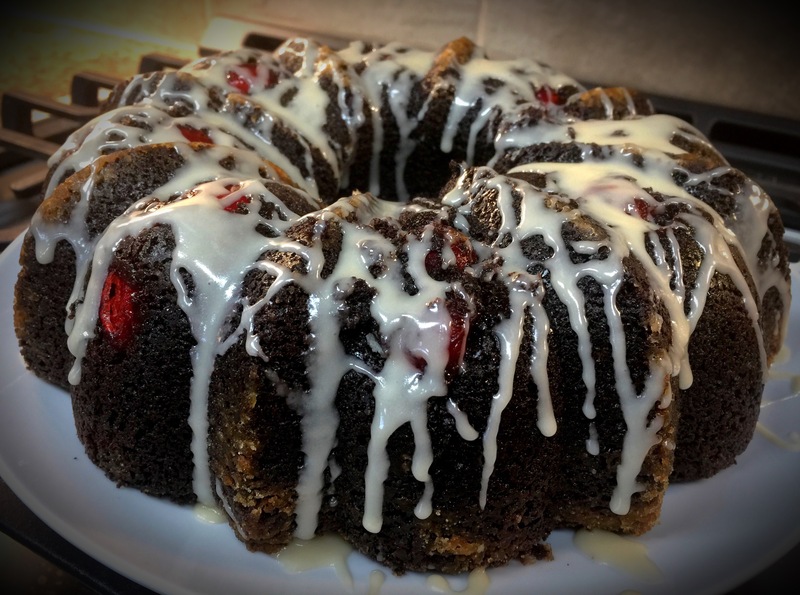 The recipe has its roots in my family history. I am of both Lithuanian and Polish decent, and this recipe comes directly from my Lithuanian heritage. My grandmother (my mother’s mother) was a great cook. She was one of those cooks who could never give you a recipe since everything she made was by look and taste. So it was with this kugelis recipe. I’ve played around with it and have gotten it to just about the way my grandmother made it. But lets face it, no one ever made it like Grandma or ever will. Before I go into my lessons learned I think it only fair to share some memories of my grandmother. She came on a boat from Lithuania when she was only 16. Her passage was paid for by the man she was to marry. It was an arranged marriage. I can’t even begin to imagine how, at that young age, she had to courage to travel by herself to meet a man she had never met and marry him. But she felt it was her way out of abject poverty. She got to the United States and immediately knew she did not want to marry this man. She was fortunate enough to meet another man she liked and convinced him to “buy-out” her marriage contract. He did and she wound up marrying him. They lived in Chicago which, at the time, had the largest Lithuanian population outside of Lithuania itself. They were not rich by any stretch of the imagination and they had four children to feed. My mother told me there were times when my Grandmother went without food so the kids could eat. But they worked hard, watched their pennies and were finally able to make ends meet. They were the embodiment of the American dream but for a long time it was not easy. Because they were so poor, my grandmother had to find ways to fill up the bellies of her kids while not spending a lot of money. A recipe like kugelis fit the bill. She could make good use out of a few potatoes, eggs, bacon and butter and turn them into a stick to your ribs kind of dish that would feed the whole family. In the end, she was noted for her kugelis and her home made bread, another inexpensive staple she made often during those times. 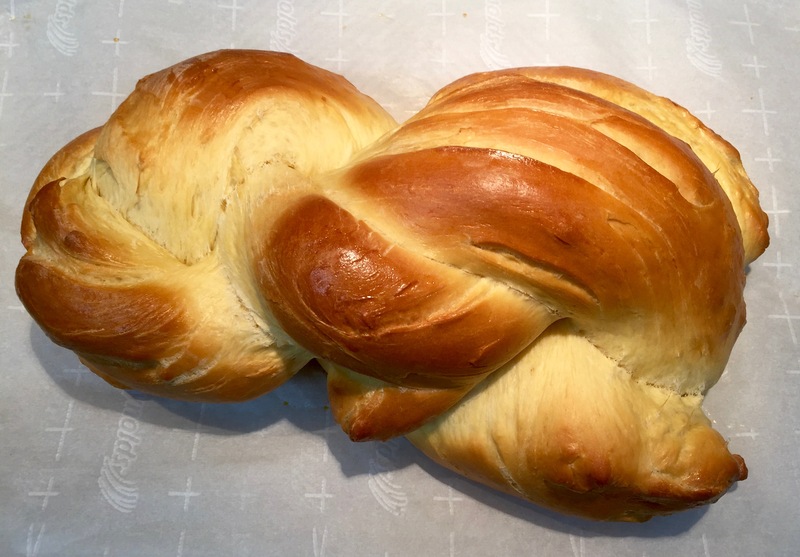 I have not mastered her homemade bread and making bread from scratch is even trickier at high altitude, but I keep trying and someday I hope to post that recipe as well. Lesson Learned 1 – There is no one way to make kugelis: Just about every person of Lithuanian decent I’ve spoken to has their own family recipe for kugelis. And the ingredients can vary. Many recipes include onions (my grandmother did not use them), some recipes use condensed milk, (again, this recipe does not) and some do not use cream of rice or wheat (this recipe does). My point is there is not one full proof way of making kugelis. I am sharing the way my grandmother and mother made it. Lesson Learned 2 – Use a little cream of rice or wheat: My grandmother used “farina” in her recipe. Farina used to be very popular when I was growing up but not so much now. As a substitute you can use either cream of rice or wheat. They are both a very creamy type of hot cereal and the little bit you use gives extra creaminess to the kugelis. Lesson Learned 3 – Beat the eggs into submission: This is one of the tricks my mother taught me. You want your kugelis to be light and fluffy so you want a lot of air in your beaten eggs. 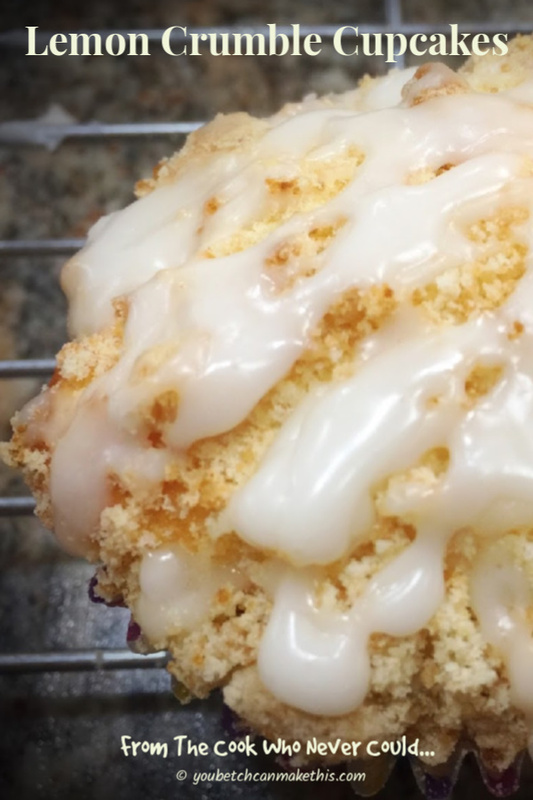 You need to beat them for about 5-7 minutes with a hand mixer. I advise you not to guess when 5 minutes is up but to actually set a timer. You will not believe how long 5 minutes feels when you are beating those eggs. But you want a very airy consistency to the eggs as seen in the picture below. 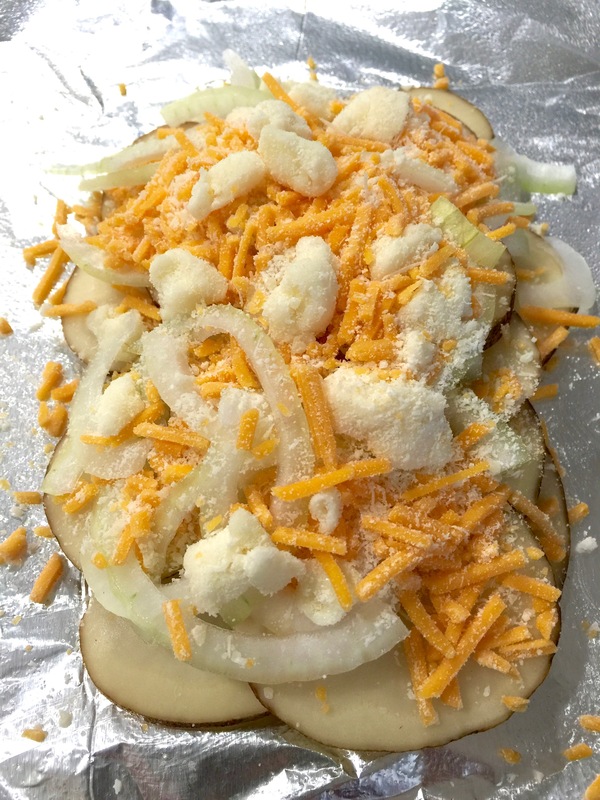 Lesson Learned 3 – Keep the potatoes soaking in water until you are ready to grate them: You use quite a bit of potatoes in this recipe and it takes time to grate them. The last thing you want to have happen is for the potatoes to oxidize and turn brown while waiting to be grated. Once you peel them put them in a bowl of cold water until you are ready to grate them. That way they will not turn brown on you. Lesson Learned 4 – Grate the potatoes by hand: My mother maintained that the only way to get the potatoes to a perfect consistency for kugelis is to grate them by hand. Let me tell you, that is quite an arduous task. Many people now use food processors to grate their potatoes, but my mother felt a food processor rendered the potatoes too watery. So, I do what my mother and my grandmother before always did and grate the potatoes by hand. You can really build up your upper body strength by grating the potatoes by hand, but the end result is so worth it. 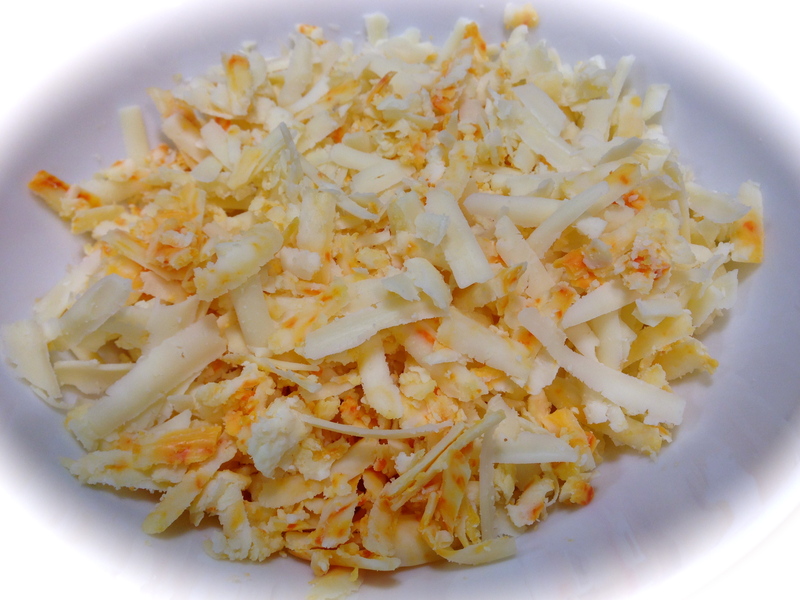 The pictures below show the gadget I use to grate the potatoes and the desired consistency of the grated potatoes. 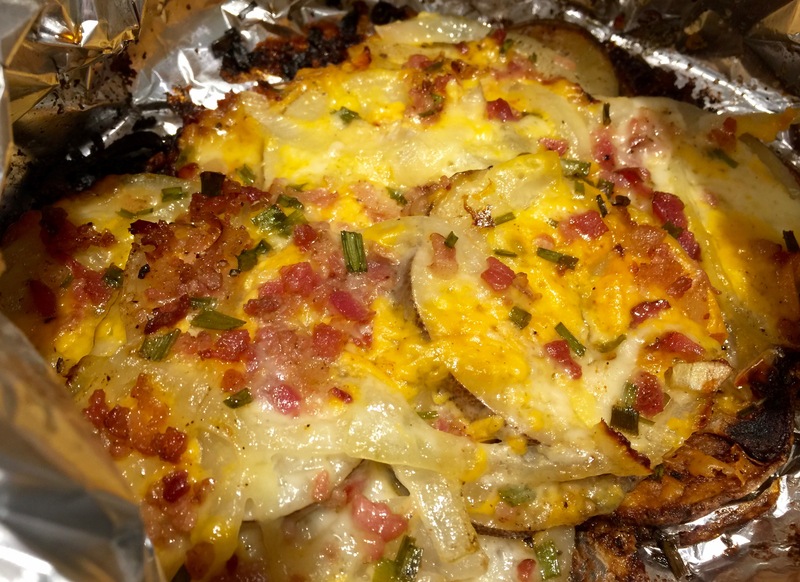 Lesson Learned 5 – Cut the bacon into lardons and cook until brown but not crisp: You want the bacon to have good color but you don’t want it so crispy that it won’t hold its shape when you mix it with the potatoes. So cut your bacon into lardons, as shown below, and cook them until they have a nice deep rich color. Lesson Learned 6 – Mix well and taste for enough salt: My mother used to say over and over again that you need to mix these ingredients really well. She usually mixed them for about 3-4 minutes and now so do I. This is not like other recipes that tell you not to over mix as the it will make the end result tough. So take your time and mix the ingredients thoroughly. You won’t be disappointed. My mother was also very specific about tasting the uncooked mixture for enough salt. Now keep in mind there is a lot of salt in the bacon so you don’t want the kugelis too salty. I always take a little taste before putting it in the baking dish just to make sure there is enough salt. I start out with one teaspoon at the beginning and add more after I’ve done my mixing if I think the kugelis needs it. I guarantee you this recipe is over the top. 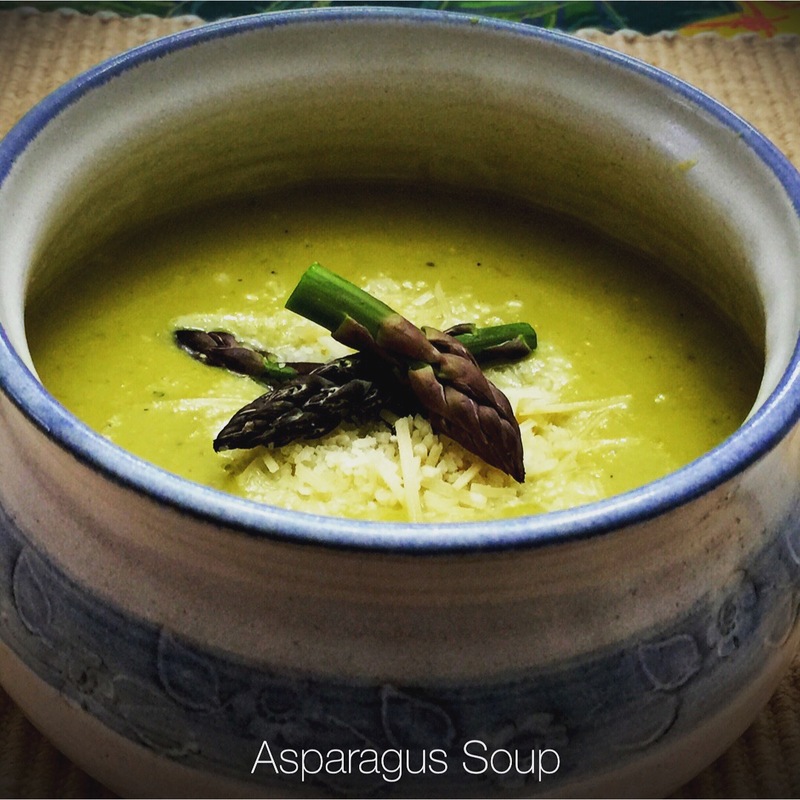 A great recipe with a treasured heritage – nothing can beat that! Enjoy! Preheat the oven to 375 degrees. Sauté the bacon and butter together. Set aside. Peel the potatoes and place into a large bowl of water until ready to use. Beat the eggs with a hand mixer for 5-7 minutes or until extremely frothy. Set aside. Grate the potatoes. Add the eggs, bacon and melted butter, cream of rice and salt. Mix very well. Pour the mixture unto a 13 x 9 x2 pan (no need to prepare the pan in any way). Bake for 90 minutes or until the center is done. Serve warm with a dollop of sour cream. Are you a rice or potato person? In my experience you are either one or the other. There is no doubt when it comes to me. I am definitely a potato person. Born and raised on potatoes, I barely had rice until I was an adult. And although I like rice and find it very adaptable in recipes, my starch of choice is and always will be potatoes! And that it why I am always thinking about new ways of making those spuds. 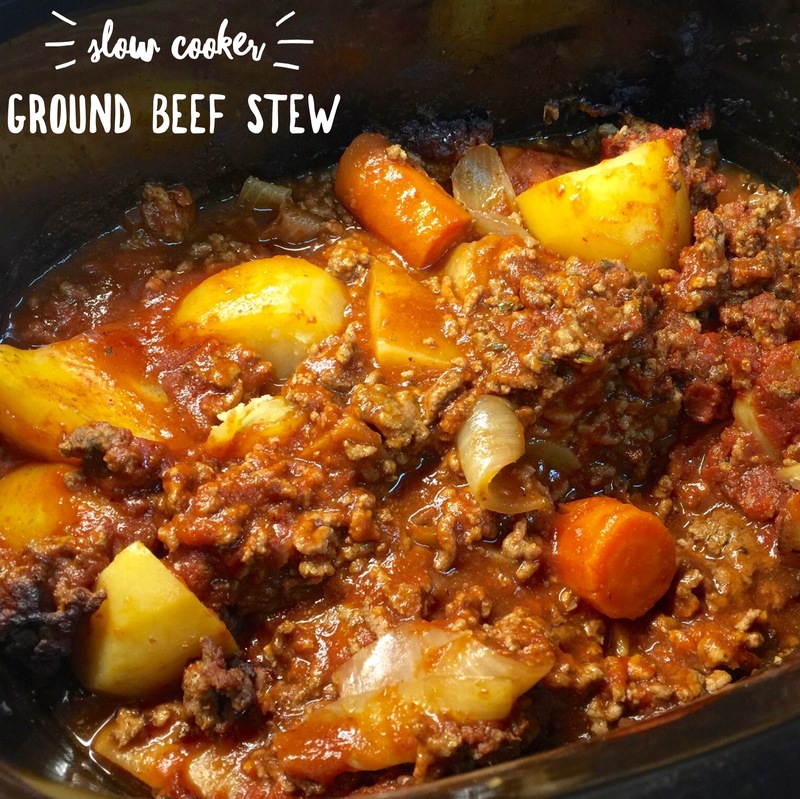 I think this recipe fits the bill of not only being incredibly easy but also incredibly delicious. When I get a, “these potatoes are good” from my husband, I know I’ve hit the jackpot. Now I will admit I made this recipe twice. The first time I tried it I felt the potatoes were not done as well as I would have liked. 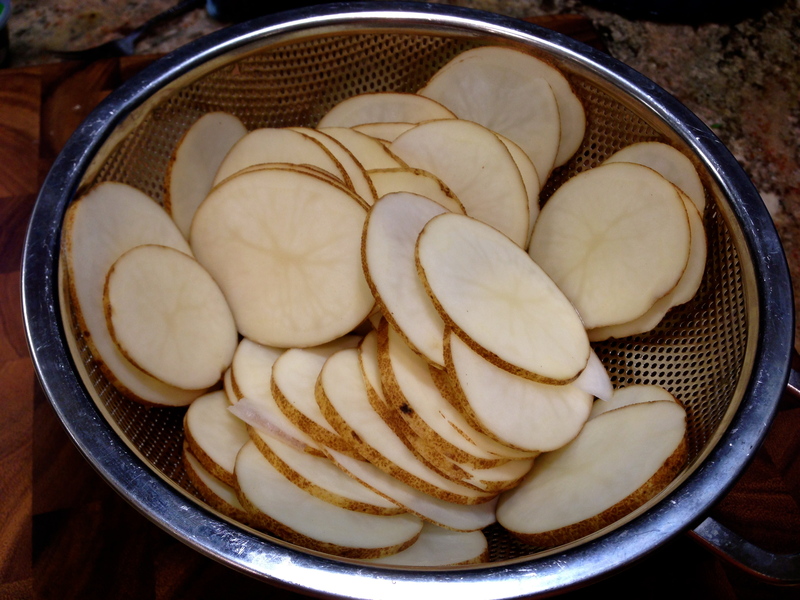 The first time I used my mandolin slicer and cut the potatoes to 3/16 of an inch. The second time I cut them to 1/8 inch and there was a world of difference in the result. As I’ve share before, I live in high altitude so recipes often take longer to cook. I cooked this potatoes casserole for 2 hours, 1 hour and 40 minutes covered with foil and the last 20 minutes uncovered. If you’re not at high altitude it will probably only take one and a half hours total. 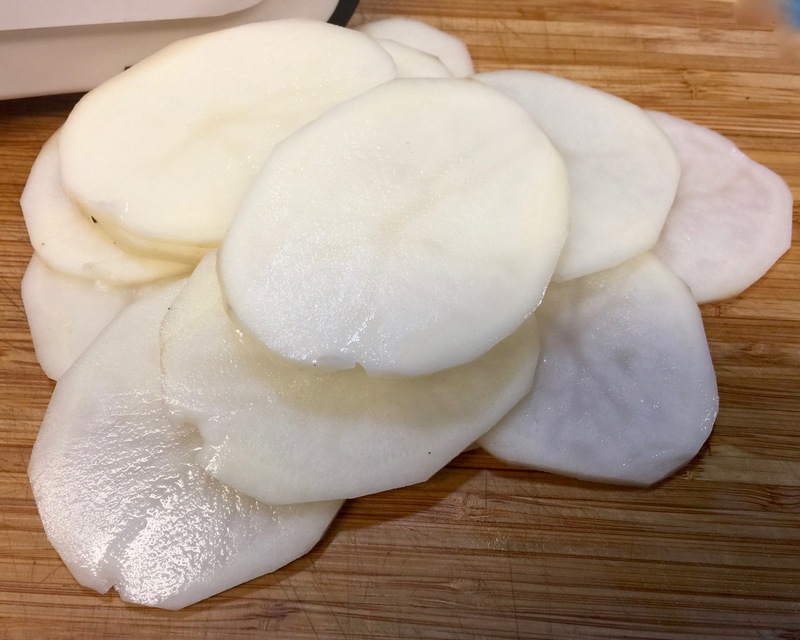 Lesson Learned 1 – The thickness of the potato slices is very important: As I just mentioned, the potato slices should be even in thickness and not overly thick. I used 1/8 inch slices and the casserole turned out perfectly. The thicker the slice the longer the cooking time. And it’s very important that all slices have a consistent thickness. Otherwise some parts will cook while others won’t. 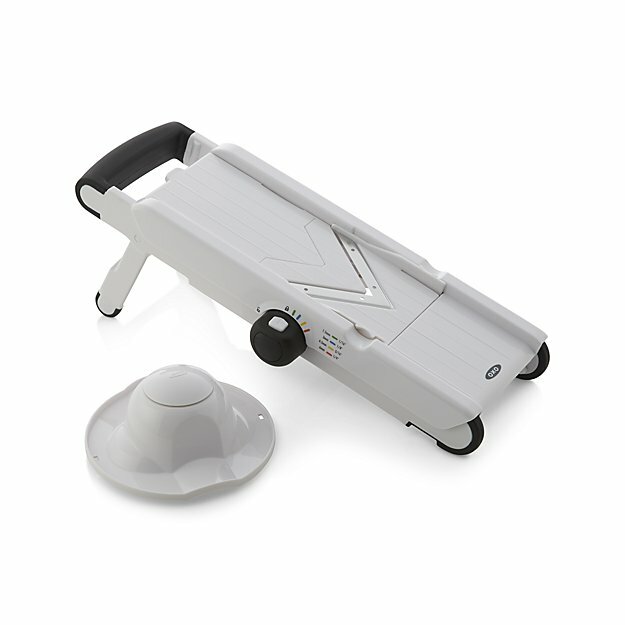 The best way to ensure even slices is to use a mandolin slicer. But be careful when using one. The blades are very sharp and you can easily slice your finger if you are not careful. Also, remember to slice your potatoes as the very last bit of prep. Potatoes will oxidize (turn brown) when they are left in the open air too long. And in this case you don’t want to soak the potatoes to prevent them from oxidizing. You want the potatoes as dry as they can be. 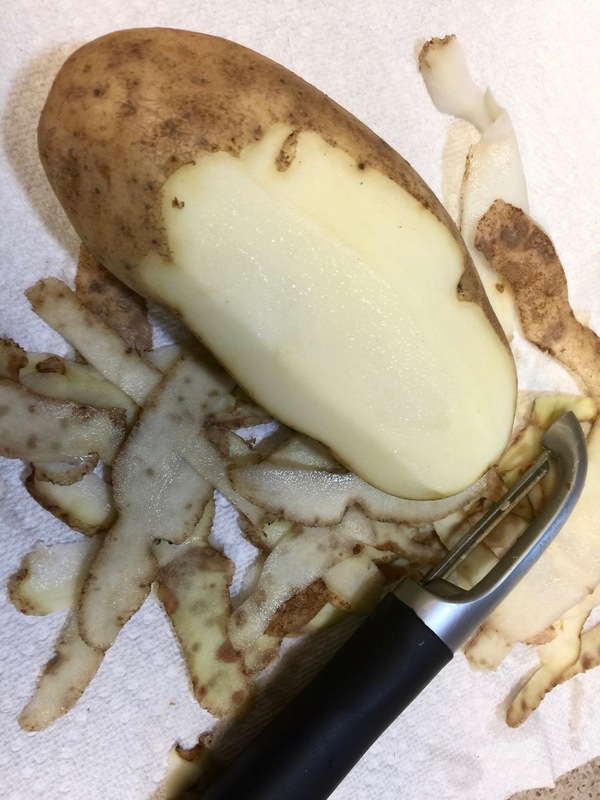 After slicing my potatoes I dried them off with a paper towel to get out as much moisture as I could. You don’t want a soggy potato casserole. So make sure your very last bit of prep is slicing the potatoes. 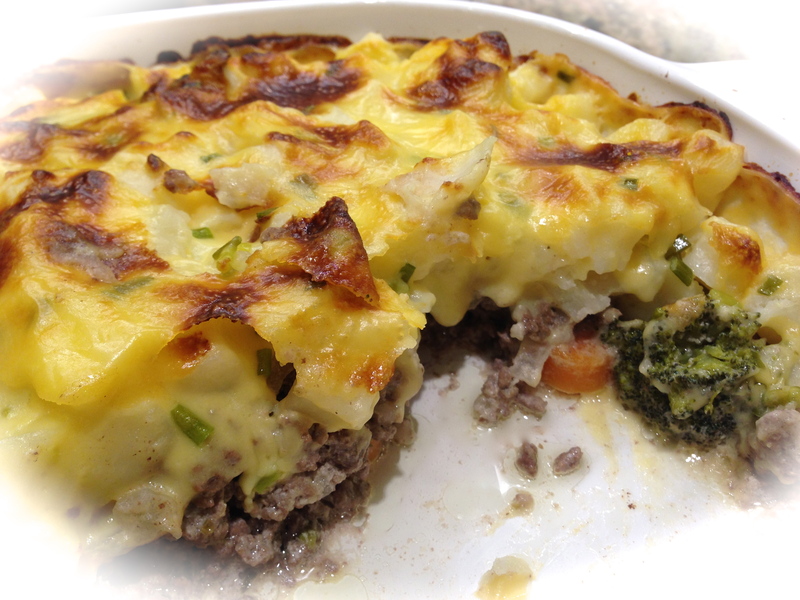 From there you want to begin assembling your casserole layers right away. Lesson Learned 2 – Use a good smokey thick cut bacon for depth of flavor: If you have a Trader Joe’s near your home, go to meat section and get a package of uncured bacon pieces. These pieces have been a tremendous find for me. Quite often they are from thick cuts and I found their flavor to be much better than the bacon you find in stores in half pound packages. They’re great and convenient when you want to add some bacon pieces to a recipe, much better than the jarred fake kind. If you can’t find them, then I would recommend any thick cut bacon cooked and crumbled into small pieces. 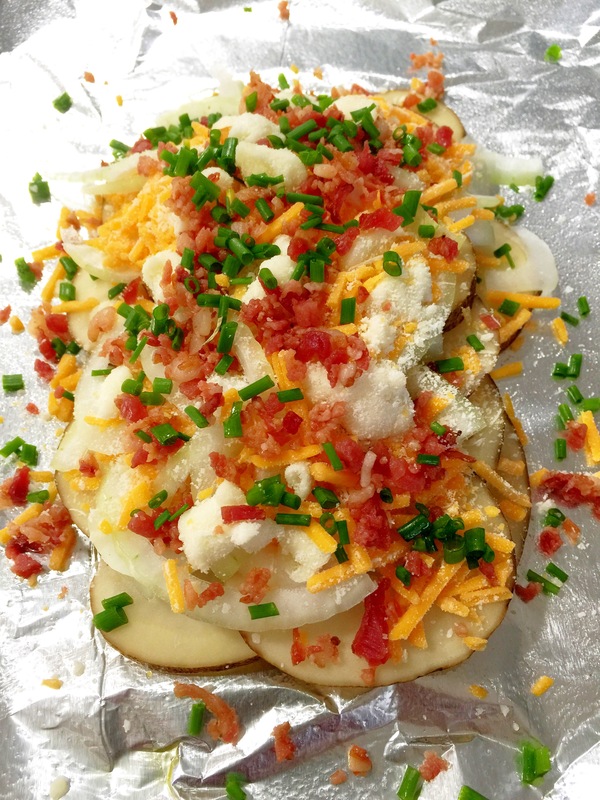 The flavor really permeates the potatoes when the bacon is a thicker cut. 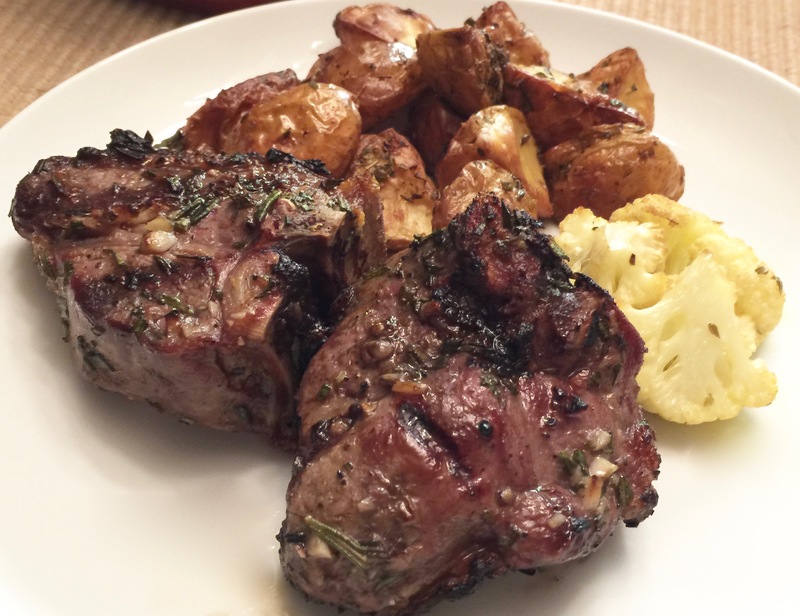 This recipe is pretty straightforward so not many lessons learned to share with this one. I can’t emphasize enough the importance of making the potato slices thin. 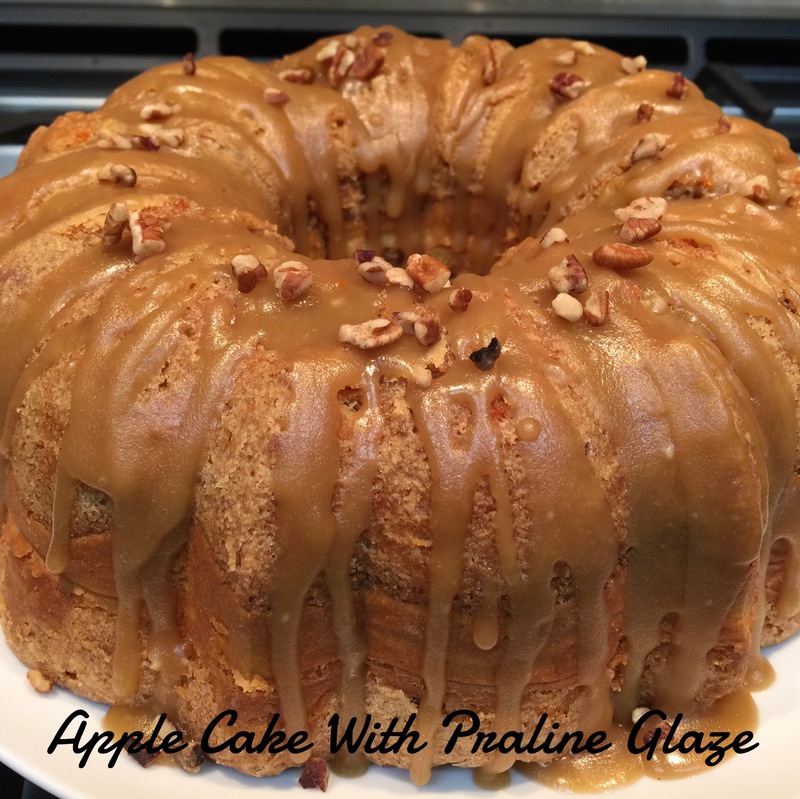 Other than that this recipe is not only delicious, it’s full proof! Enjoy! Preheat oven 375 degrees. Butter or spray a 9 inch pie pan. Layer potato slices in the pie pan, slightly overlapping the slices. Season with salt and pepper. 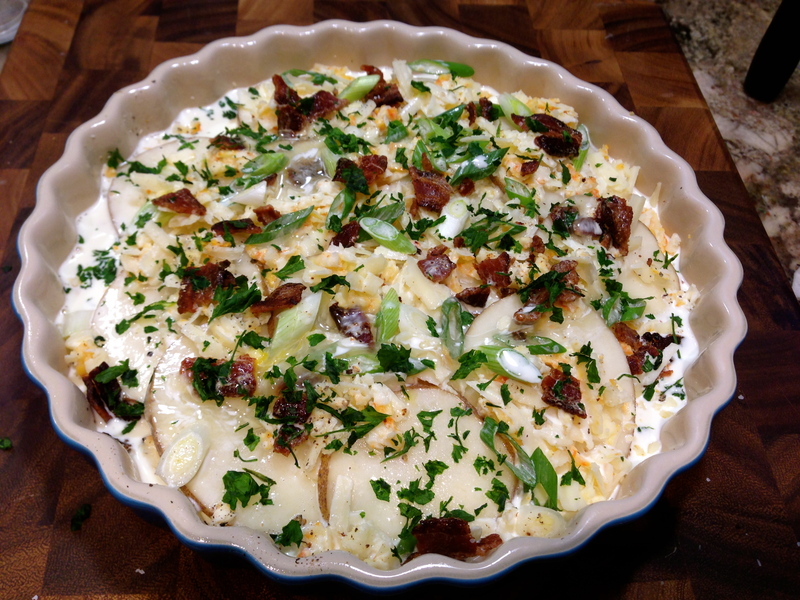 Sprinkle half the cheeses over the potatoes and add half of the crumbled bacon and green onions. Repeat the entire process ending with the top layer being the cheeses. In a small bowl whisk together the milk and egg. Pour the mixture over the potatoes. 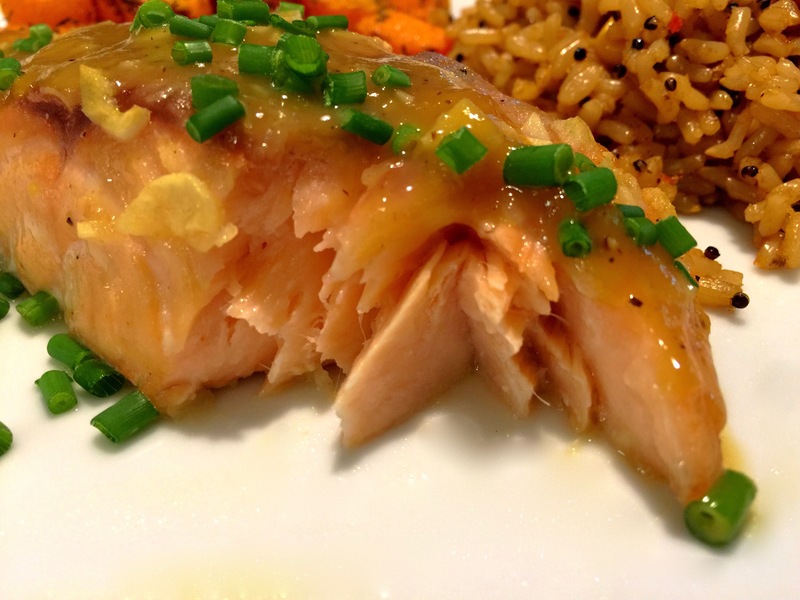 Cover with foil and cook for 1 1/2 – 2 hours. Remove the foil during the last 20 minutes of baking. Allow the dish to rest for 5 minutes. Serve immediately. Labor Day is around the corner. Time for some of those last of the season summer parties. And what’s a summer party without baked beans? I have to admit, I never made baked beans from scratch before. It was so easy just to open a can and warm it up. But like anything else, when you make something from scratch you control the ingredients, especially the important ones like sugars and salt. Next time you’re in the grocery store pick up a can of baked beans and read the ingredients. You’ll see things like water, sugar, some sort of thickener, salt, acetic acid, citric acid, natural flavors… (what the heck are natural flavors anyway)? And if you look carefully, chances are the salt content is simply off the charts. So anytime you can make something homemade it’s just so much better. I have to admit I was surprised at how easy these were to make and I controlled what went in them. 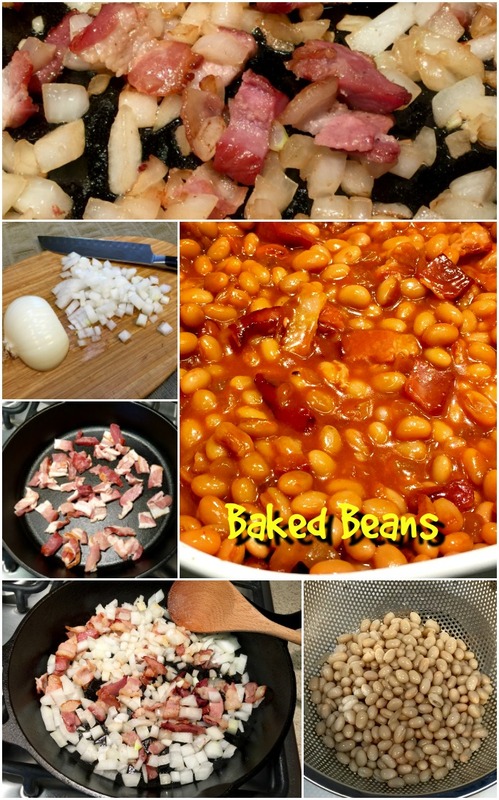 Lesson Learned 1 – Use thick cut bacon in this recipe: Since the bacon gets cooked a lot in this recipe (once on the stove and then again in the oven) I recommend a thick cut bacon especially if you want it to be clearly visible in the beans. 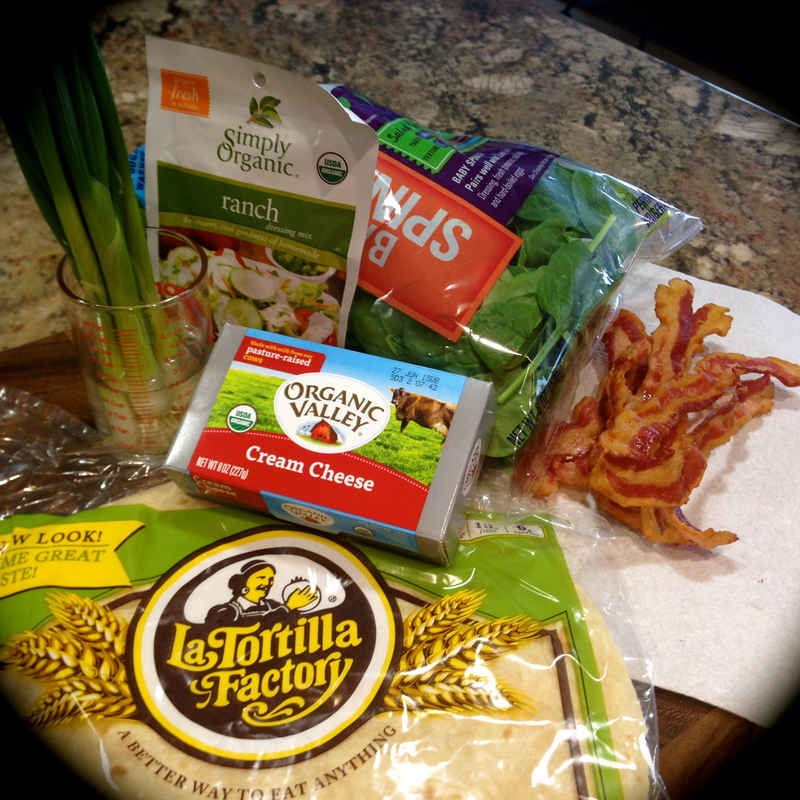 I found a package of bacon pieces at Trader Joes and it was perfect for this recipe. The pieces were all from thick cuts and slabs and there were some pieces that were almost all pork and no fat. 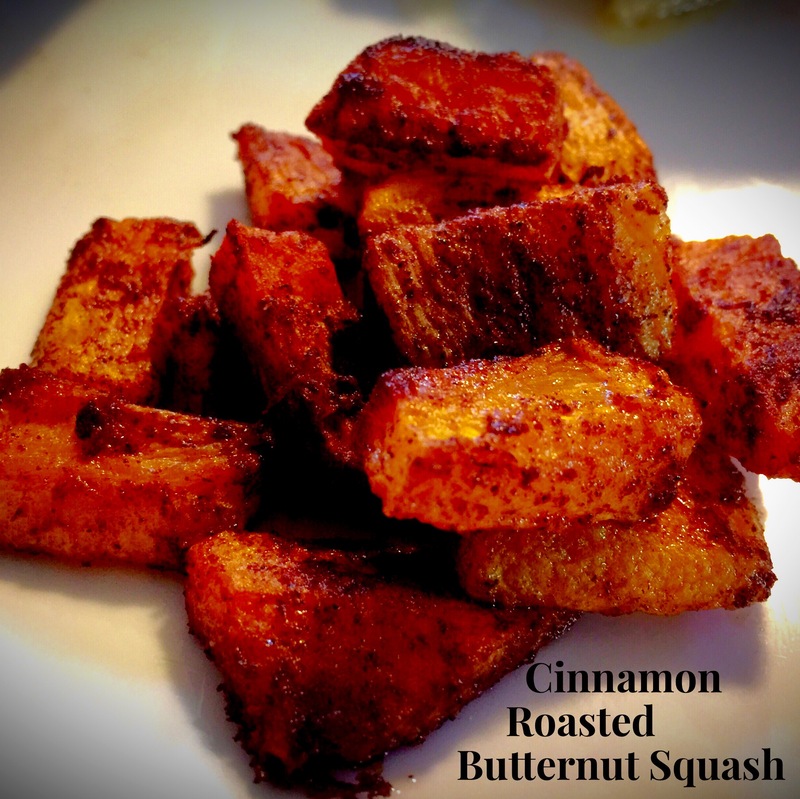 I used probably the equivalent of 3-4 slices of bacon in this recipe and it turned out great. 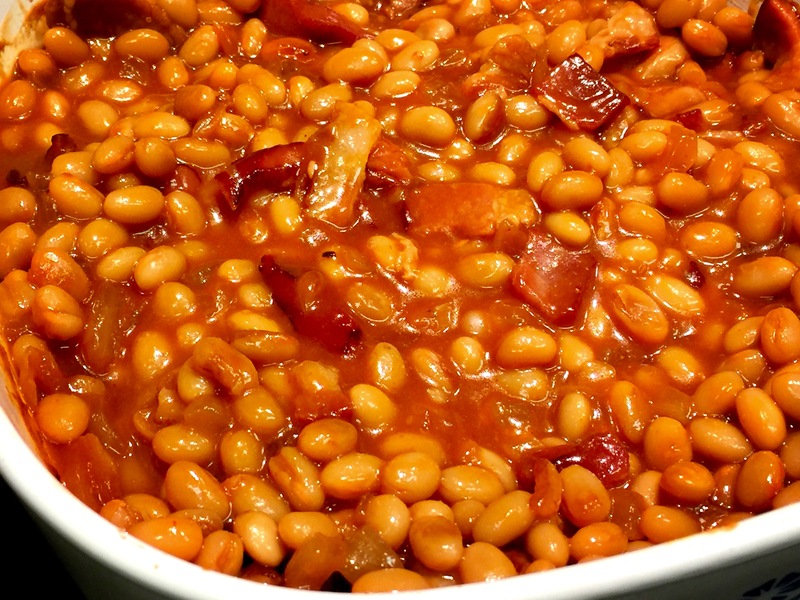 Lesson Learned 2 – Drain and wash one of the cans of beans: Beans in a can are packed in a lot of salt and your baked beans will wind up too salty if you put the liquid in from both cans. It’s best to drain one of the cans of beans and rinse them with water before you add them to everything else. 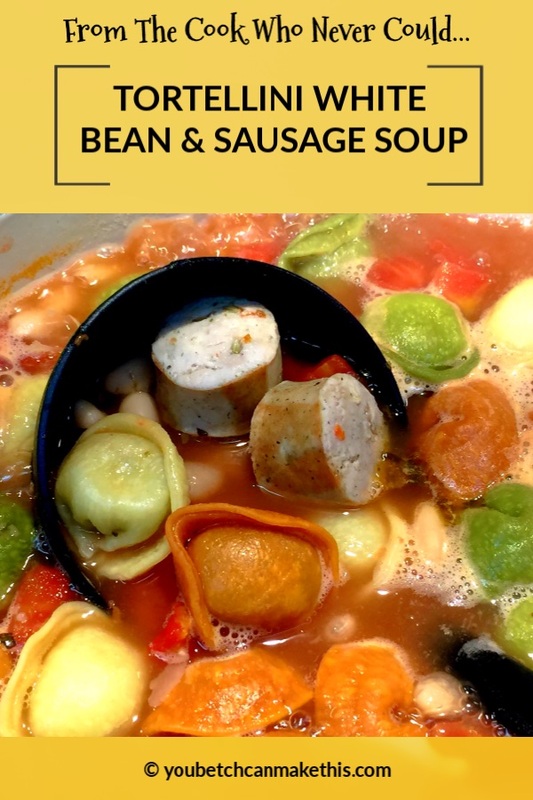 Lesson Learned 3 – You can choose from a wide variety of beans: I used navy beans in my recipe but you can use Great Northern, cannelloni or white beans as well. Just remember to drain and rinse one can of them. 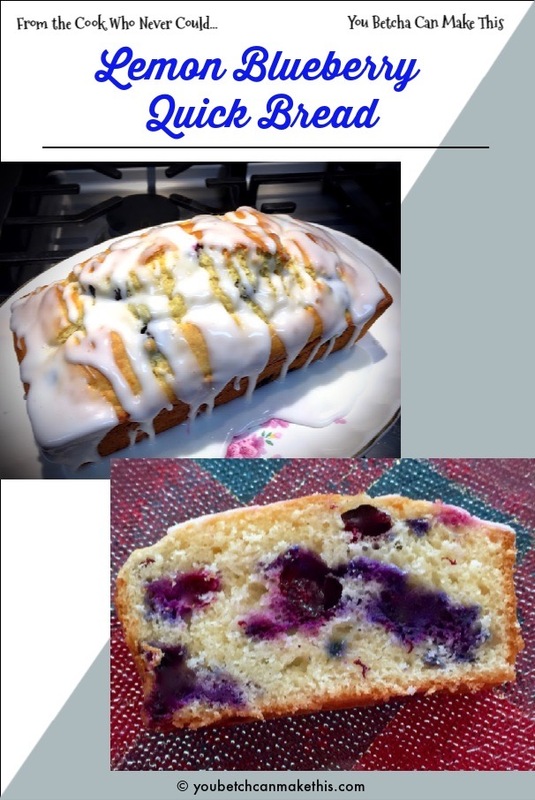 Lesson Learned 4 – Don’t be afraid to experiment with ingredients: These days when I make something I study several recipes and more often than not concoct a version of my own that I will like. For example, most recipes I found suggested using dark brown sugar, which is really just light brown sugar with added molasses. I didn’t have dark brown sugar but I had light brown sugar and I had molasses. I used that and I think the flavor was richer because of the purity of the ingredients. I also added some liquid smoke to give the beans that bar-b-que smell and flavor. It worked out beautifully. 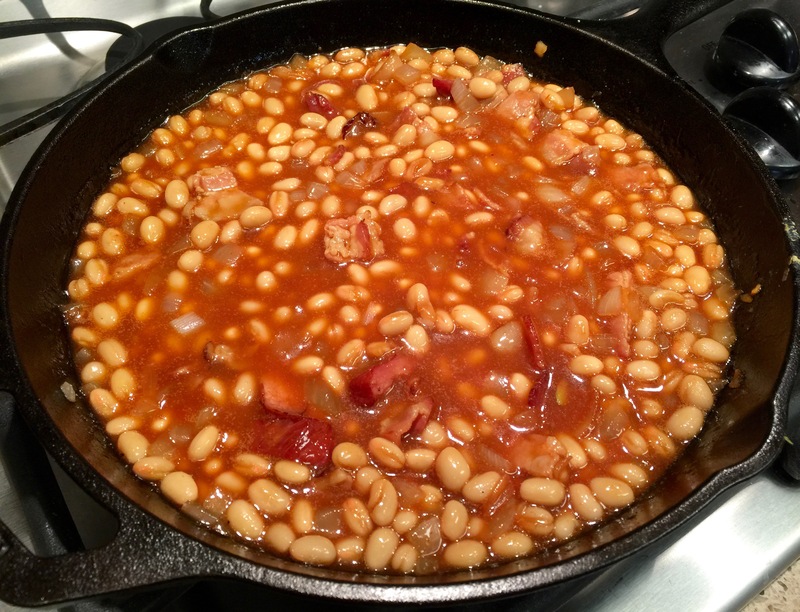 After I made this recipe I thought I would probably not post it on this site as I wondered who would get excited about something as mundane as baked beans. Well, I posted a picture of them on Facebook and got so much feedback that I felt an obligation to post the recipe. And that’s so me. Sometimes the recipes I think will get the least attention get the most. I hope you enjoy this one! Preheat oven to 350 degrees. Put the bacon pieces in a large high edged skillet and cook until the bacon is slightly crisped. Add the onions and cooked until slightly caramelized. Add one can of beans with the liquid. Drain and rinse the other can of beans and add to the mixture. Add the ketchup, brown sugar, molasses, mustard, vinegar, worcesterhsire sauce and liquid smoke. Stir until completely combined and simmer for a couple of minutes. Salt and pepper to taste. Transfer the mixture to a 1 1/2 quart baking dish. Bake uncovered until thick and bubbly, approximately 50 -60 minutes. Serve warm. 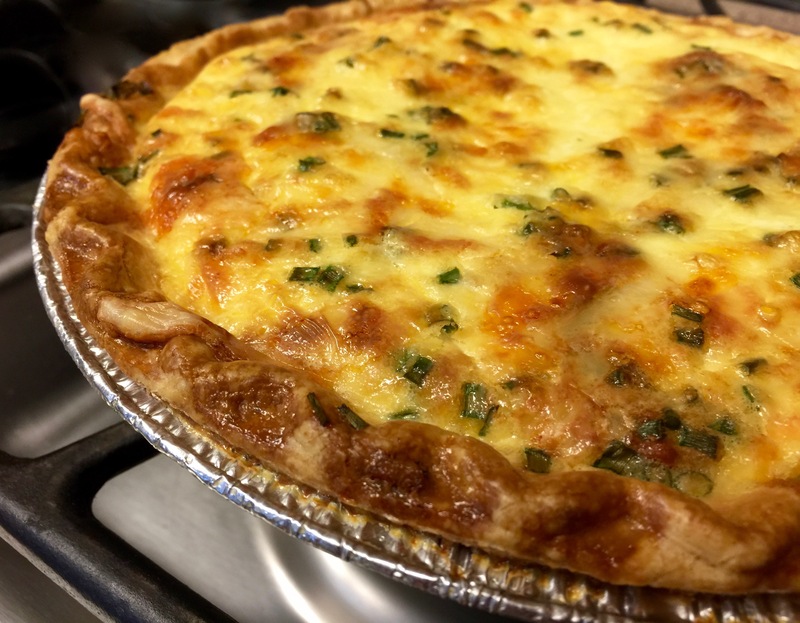 Quiche is a great way to clean out your refrigerator. 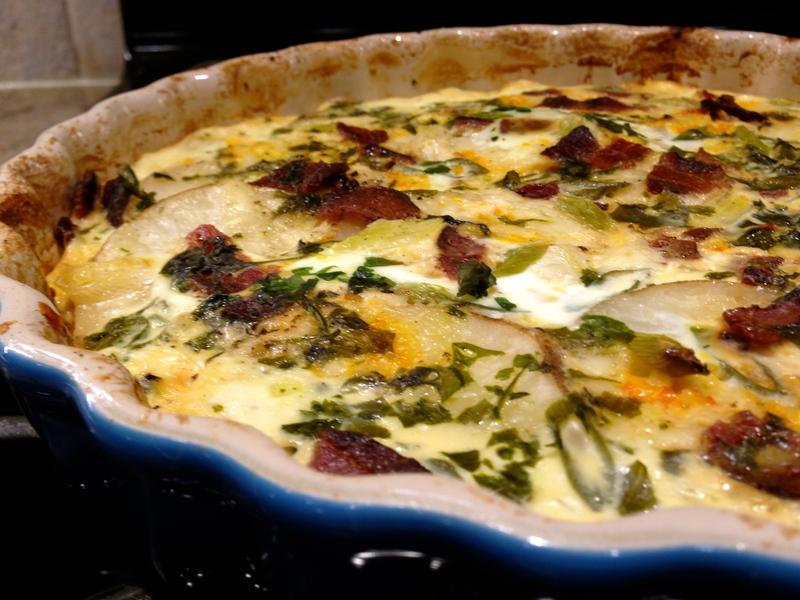 It seems you can add whatever you like to a basic quiche recipe and get a fantastic entree. Whether it be meat, vegetables, herbs or a combination of any or all of them, you can always come out with a great meal. 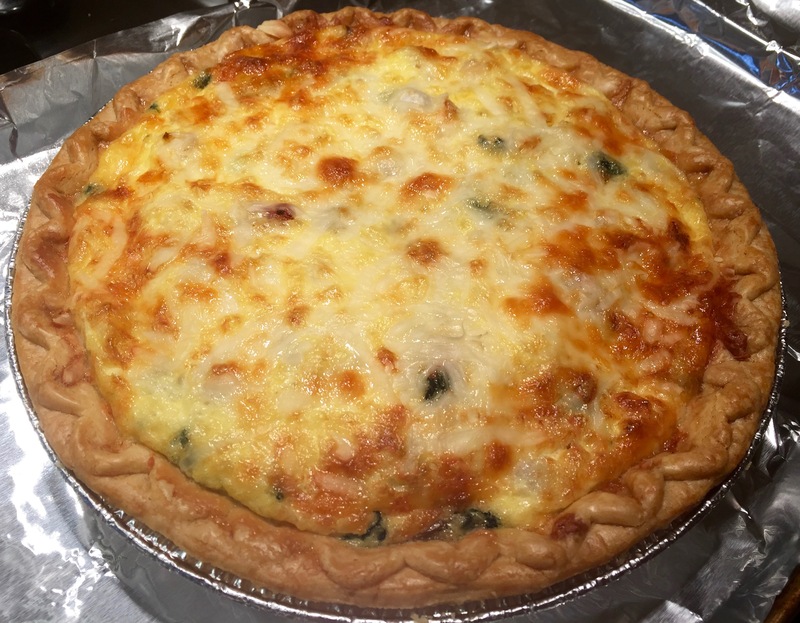 I’ve added many things to quiche like broccoli, carrots, peas, spinach, pearl onions, cauliflower, ham, chicken – it just seems the combinations are endless. 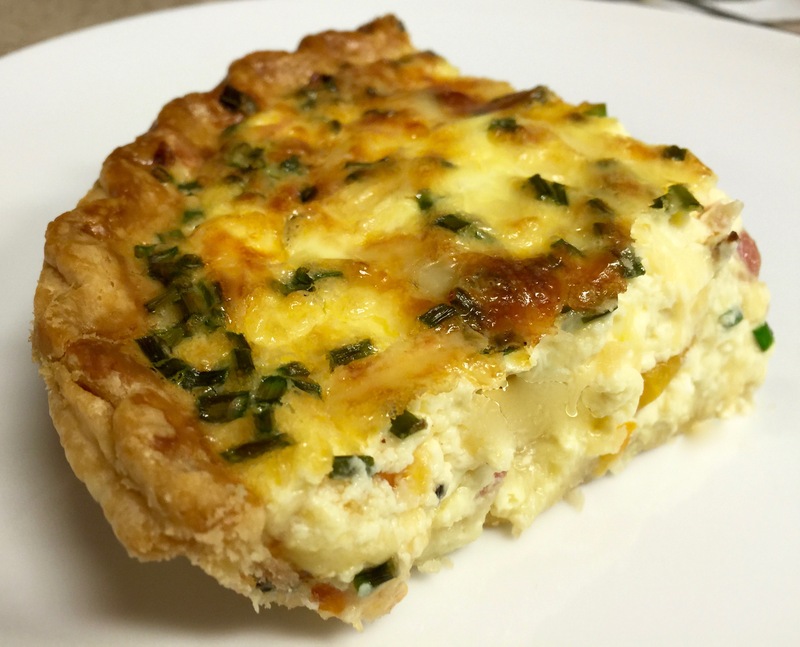 So last week I looked in my refrigerator and I had some bacon, butternut squash cubes and chives and I thought, ok quiche! Lesson Learned 1 – Whether you use a home made or store bought pie crust you need to blind bake it: Blind baking means you partially bake the pie crust before adding the custard mixture to it. That way the crust does not wind up soggy. The procedure is rather simple. Now I’ve mostly used store bought pie deep dish pie crusts. I take the crust out of the freezer and with a fork make some prick marks all over the bottom and sides of the crust being careful not to stick the fork all the way through the dough. This helps keep the dough from rising too much during the baking process. In order to ensure it stays flat I also cover the crust with parchment paper and weigh down the parchment paper with some uncooked beans I keep in mason jar in the pantry just for this purpose. You can also use pie weights. You can find those in most any store. Whatever you use, make sure the bottom and side are weighted down. Bake the crust for about 20 minutes and then remove the parchment paper and weights and bake for another 10 – 15 minutes. If you use beans you may see a little moisture on the bottom of the crust after you remove the parchment paper. No worries, the moisture will be gone when you bake the crust for the additional 10-15 minutes. The blind baking process is done when the crust is just starting to turn brown. If you use a home made crust you should set it up in a pie plate and then put it in the freezer for about 30 minutes before you do the blind baking. You want the dough to be a little stiff when it goes into the oven. Lesson Learned 2 – To precook or not precook your ingredients before adding them to the egg/custard mixture: This is where you may have to learn by trial and error. Some ingredients you can just add but others need to either be cooked or partially cooked before you put them in the batter. I mentioned I decided to make a bacon, butternut squash and chive quiche. 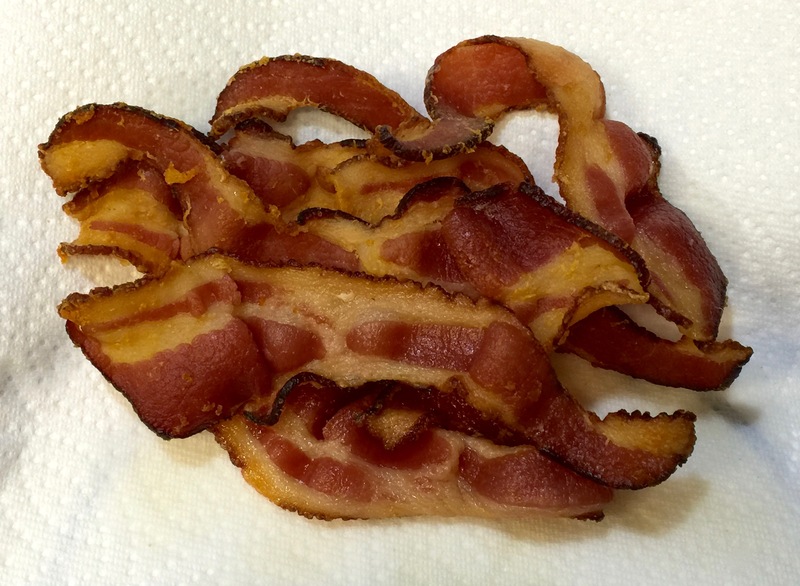 Bacon needs to be fully cooked, drained and cooled before adding it to the batter. 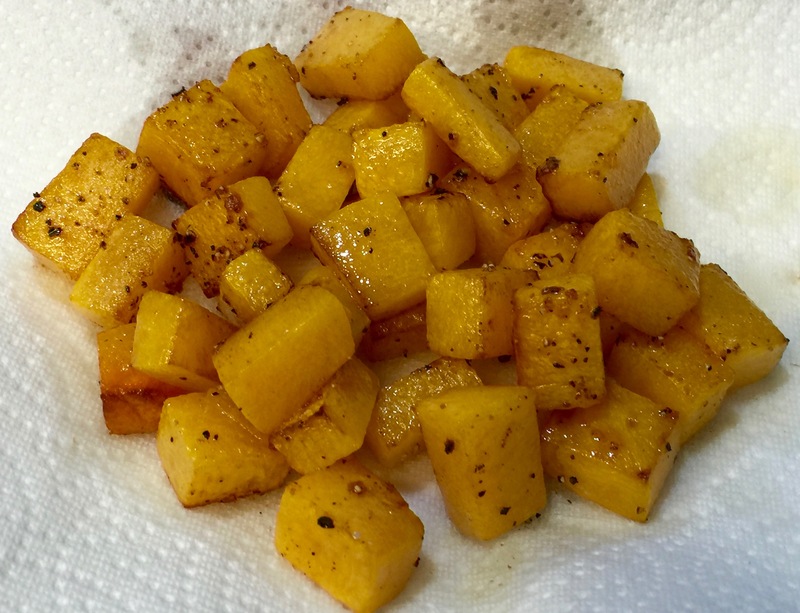 The squash, if cut in small pieces about 1/2 inch square, can be cooked until the edges are just slightly turning soft and then drained and cooled before adding it to the batter. Chives you can just chop and drop in. I cooked the bacon first and then I cooked the squash in the bacon grease until it just started to soften. The result was perfectly cooked squash when the quiche was finished. With cauliflower I found that if I cut the florets into bite-sized pieces I can just add them to the batter and I get perfect al dente pieces when the quiche is done. Carrots you will need to cook. I just add frozen pearl onions and they turn our perfectly. If you decide to use diced onion you will need to cook them. Ham is generally precooked so you can just cube it and add it. Spinach should be wilted and drained. Mushrooms should be cooked to release their moisture and drained. So you see, not one size fits all when it comes to adding ingredients to the egg/custard mix. But I know you’ll get the hang of it. Just remember, you don’t want hot things or a lot of moisture going in to the egg/custard mixture. Lesson Learned 3 – Let the quiche rest for about five minutes after you take it out of the oven: By doing this you give the custard a change to get a little firmer and the quiche will be easier to cut. Resist the temptation to cut it right away, no matter how great it looks! Preheat the oven to 350. Prick the bottom and sides of the frozen crust with a fork. 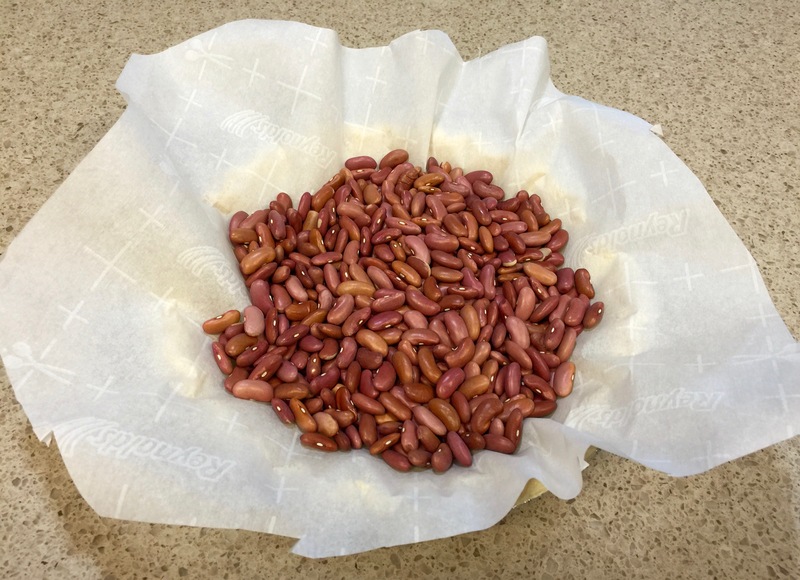 Cover with parchment paper and weigh down with beans or pie weights. Bake in the oven for 20 minutes. Remove from the oven, take off the parchment paper and weights and bake the crust for another 10-15 minutes or until it just starts to turn brown. Remove from oven and let cool. Prepare the filling while blind baking the crust. Cook the bacon until crisp. Drain on paper towels and cut into pieces when cooled. Cut the squash into half inch squares and saute in the bacon grease. Remove the squash when it just starts to soften and drain on paper towels. Mince the chives. In a large bowl crack 4 eggs and slightly whisk to break the yokes. Add the milk, cream and salt and whisk thoroughly. Add your filling and stir to combine. Put half the cheese on the bottom of the pie crust. Pour in the filling. Put the other half of the cheese on top of the filling. 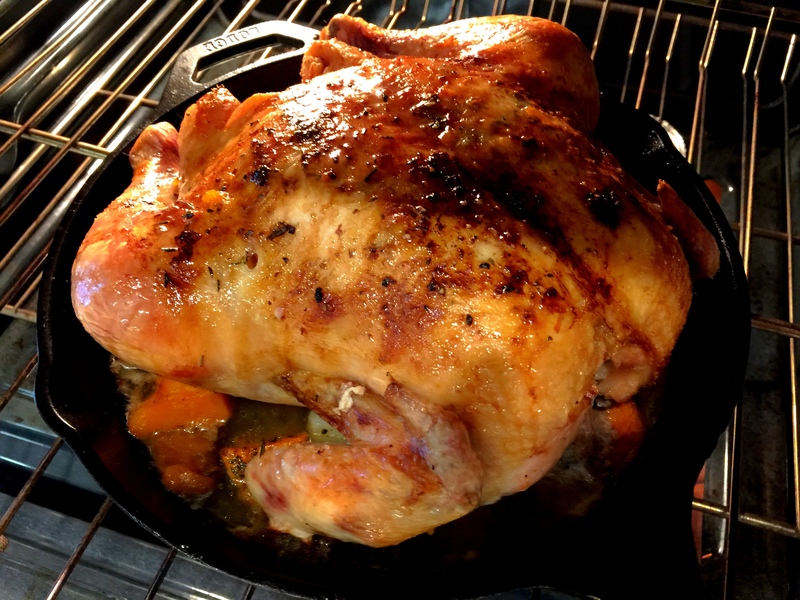 Place the dish on a foil lined baking sheet. Bake in the oven at 350 for 40-45 minutes. Let stand for five minutes. Slice and serve. Summer time is grilling time. And I love to grill though I have to admit I’m not a purist. I grill on a gas grill. Some people like fooling around with coals and all that stuff. Not me. I like a grill that heats up on its own and can tell me the grilling temperature I am working with. That’s about how hard I want to work at grilling. 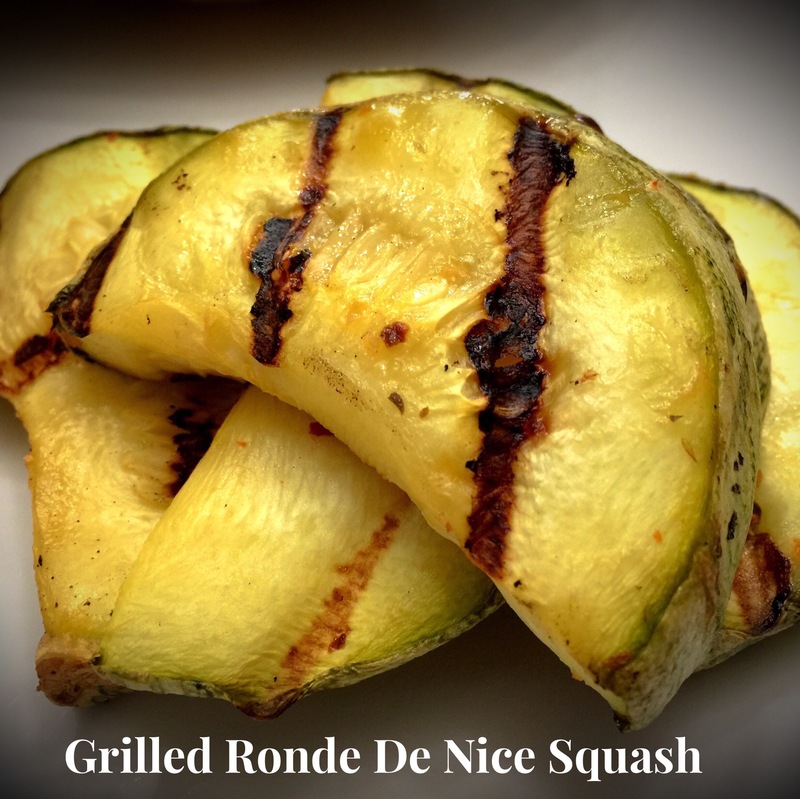 Things just taste better on a grill, don’t you think so? From chicken, to steak, to brats and burgers there’s nothing like it. So the other day I had it in my mind to grill a filet I’d had in my freezer for a while and I also decided to try grilling some potatoes in a foil packet. 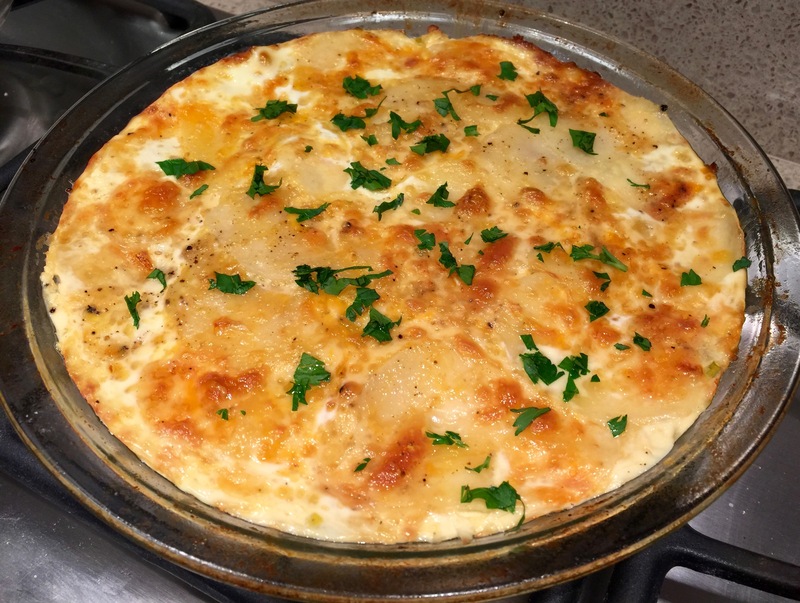 A few years ago I posted a recipe for a blue cheese, onion, garlic and basil potato packet. This time I tried for something that mimicked a steak house baked potato. Now let it be known I love grilled steak, but this time I found the grilled potatoes to be the star of the meal. 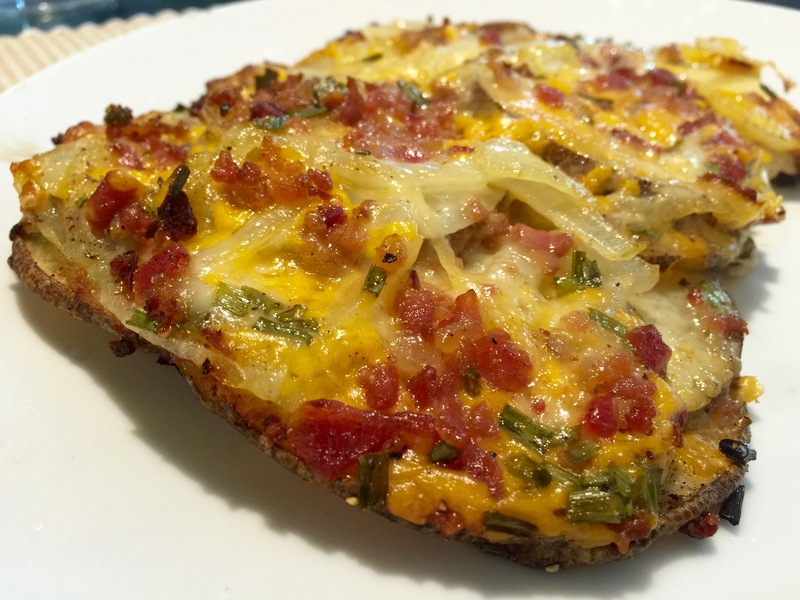 This recipe is so easy and so flavorful I bet it will become your go-to grilled potato recipe. Lesson Learned 1 – For uniformity in cooking, use a mandolin slicer to slice your potatoes: The mandolin slicer I use is pictured at the left. I like this particular one for a couple of reasons. First, it was reasonably priced. I just can’t see spending close to one hundred dollars on a mandolin slicer. This one is about half that amount. Second, it has a variety of blades and cutting options (slicing, julienne, french fries). It is a powerful tool that can cut your prep time significantly. For me, the best part about a mandolin slicer is that you get uniform cuts. That’s important in this recipe. 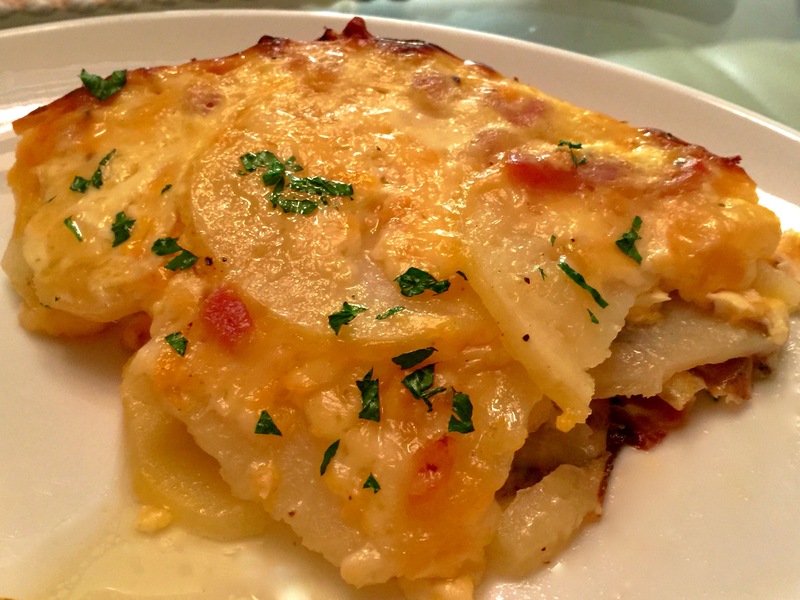 Having various thicknesses in your potatoe slices will skew the cooking time. You want all of the potatoes to be cooked through at the same time. I’ve found no better way to do that than with a mandolin slicer. One other tip: You see that little round thing next to the slicing unit? That is a hand/finger guard. You should ALWAYS use that when cutting with a mandolin. The mandolin blade does’t distinguish between vegetable and human flesh. It will cut both easily and with equal proficiency. So be very careful when using a mandolin slicer if you cherish your fingers and hands. Lesson Learned 2 – Keep the potatoes on a little longer for great crispiness on the bottom: This is the first time I tried these. When I checked the potatoes at 40 minutes at 400 degrees, they were done. But I still had more time left for finishing my filet. I left the packet on an additional 10 minutes and much to my surprise that created a wonderful crispy crust on the bottom of the pile of potatoes. It was almost like having a bottom layer of potato chips with the wonderfully soft and flavorful potatoes on top. I think I’m always going to do them this way. I loved the distinction between the crunchy bottom and the soft top. It was delightful! Lesson Learned 4 – The layering process is very simple: Here it is in pictures. Doesn’t the uncooked version look simply divine as well. I love the contrast of the colors. And this dish looks phenomenal both uncooked and cooked. And it’s really easy to put together. One potato serves two people so the dish is pretty economical as well. I loved this one so much I made it two nights in a row. I hope you love this too! Light your grill to high heat. Divide the potatoes and onions up on two large sheets of foil sprayed with olive oil cooking spray. 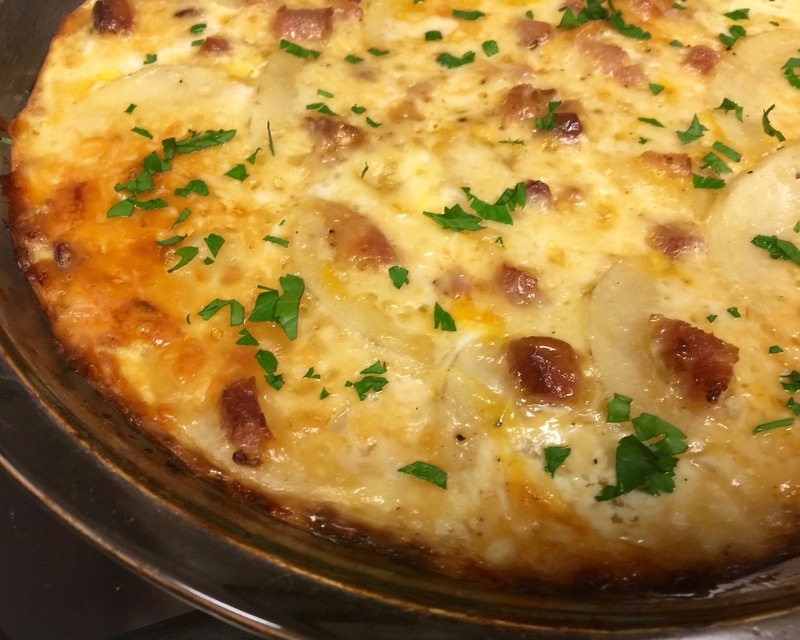 Combine the cheeses and top the potatoes and onion with the cheese mixture. 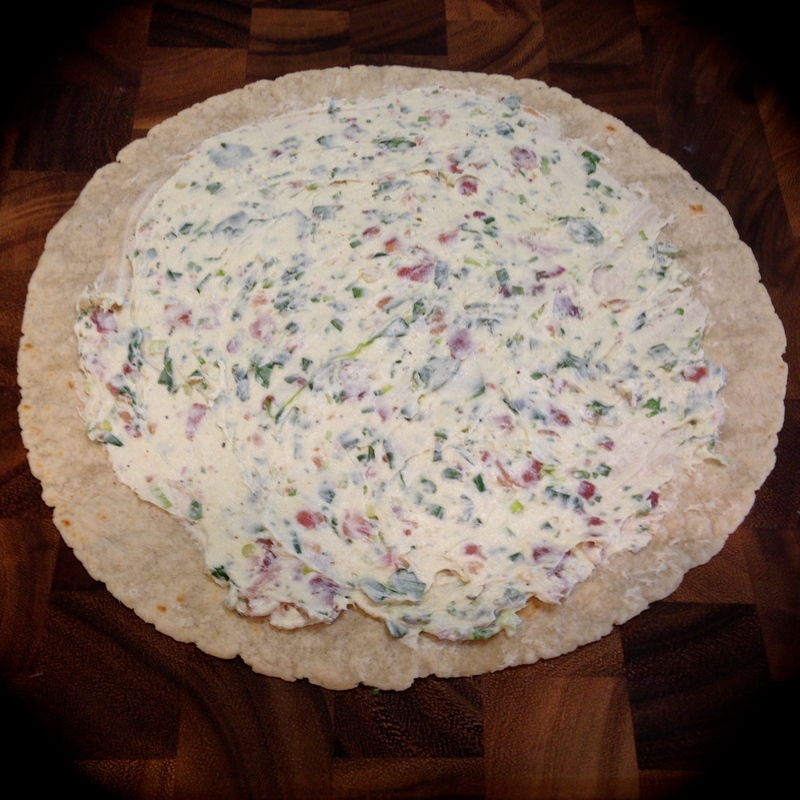 Top with bacon bit and chives. Dot the tops with butter. Season with seasoned salt and pepper. 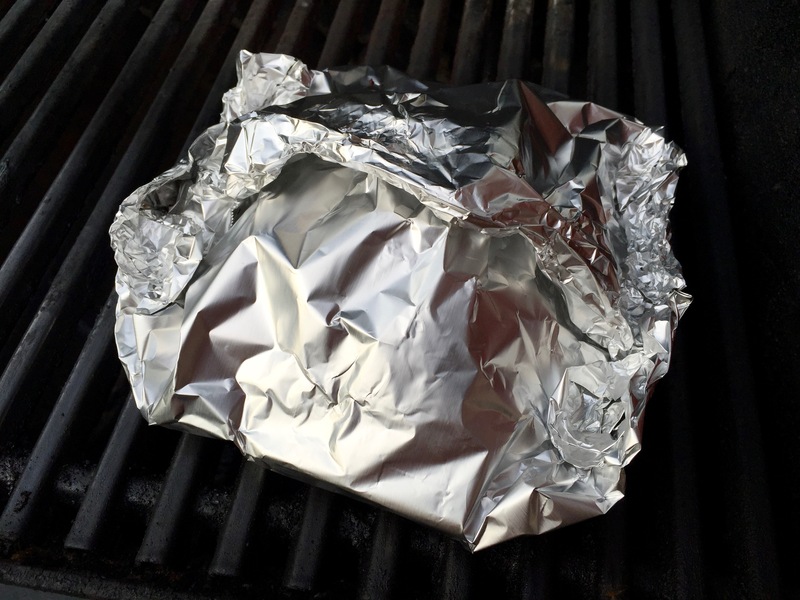 Fold the foil over the top and crimp the edges. Fold the sides up and crimp the edges securely. Grill for 40 minutes (add an additional 10 minutes for a delightful crispy bottom). Open the foil carefully and serve immediately. I LOVE potatoes. As a friend of mine once said, “I never met a carb I did’t like.” That’s so true, but these days we know you need to balance your carb intake in order to stay healthy. Not an easy task for someone who was raised on meat and potatoes. But I’m trying. I wanted to try a recipe like this for a while, so I justified it by serving it with baked cod and oven roasted asparagus. It turned out great and I was careful not to over indulge. So for all of my carb lovin’ friends out there, here’s one that you can add to your arsenal of recipes. Lesson Learned 1 – Give the potatoes a head start: I know this and I still didn’t do it. It’s always best when making a potato casserole to cook the potatoes for about five minutes in boiling water. That takes the edge off of them. Because you cook this casserole for an hour and three quarters I didn’t think I would need to do that. Wrong. The potatoes were done but not as tender as I would have liked. So remember, give your sliced potatoes a bath in boiling water just until they start to soften slightly (no more than 5 minutes). Then drain them, being careful not to break them, and then put together your casserole. You’ll get great results. Lesson Learned 2 – There can never be too much cheese: Originally I though this recipe would need two cups of cheese (1 of each type). Once I began to put together the layers I added even more (1/2 cup each). Make sure you get a good melting cheese like gruyere, havarti or monterey jack and generously cover the potatoes. You can combine that with some sort of cheddar or better yet be your own chef and experiment. I used a white cheddar gruyere blend combined with a marbled cheddar. It was delish. I am writing the recipe from what I used, but you can certainly make substitutions. This recipe is so easy and so good. 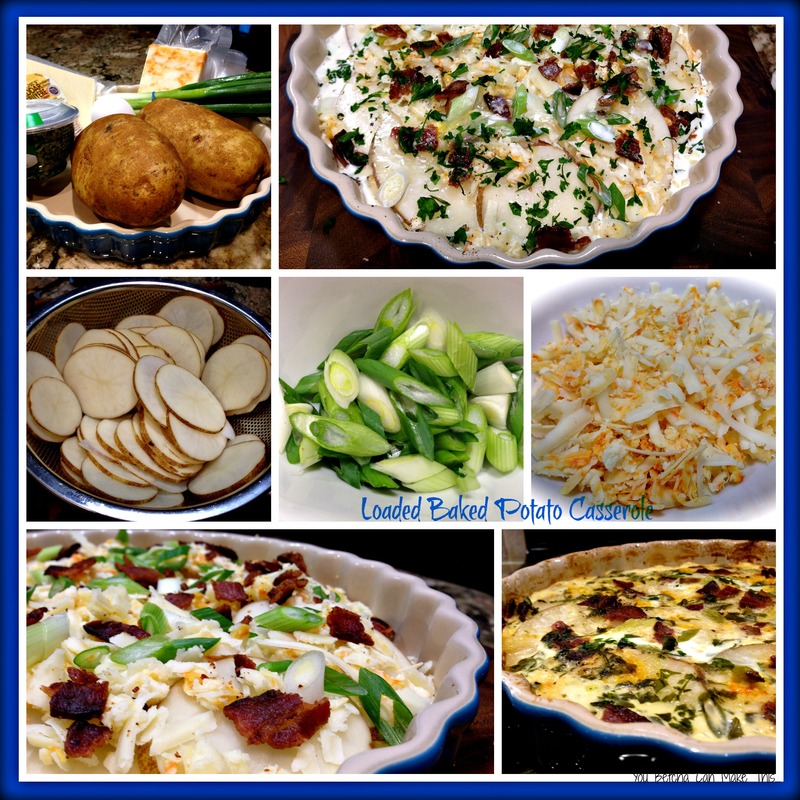 It’s a great way to get the flavors of a loaded backed potato in casserole form. The leftovers are great as well. Just heat them in the microwave and serve. Enjoy! Preheat the oven to 375 degrees. Cook, drain and crumble the bacon. 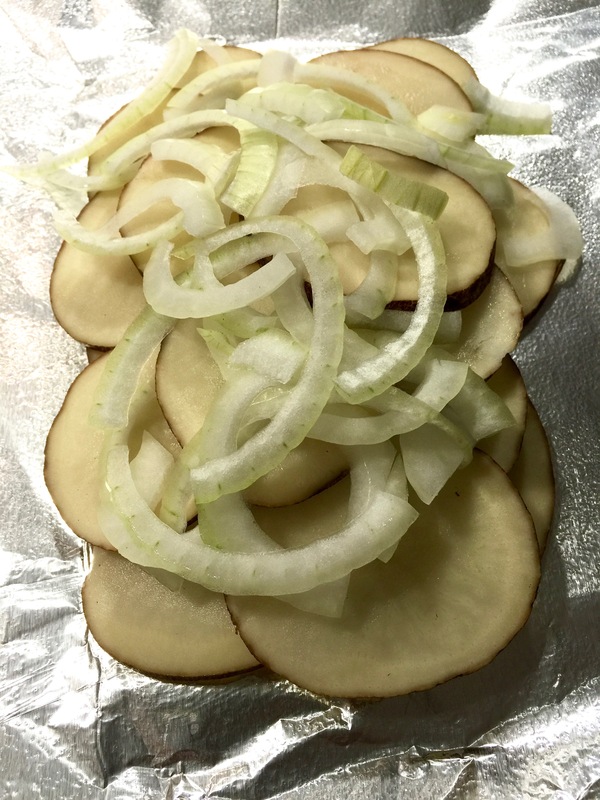 Slice the potatoes to 1/4 inch thick (use a mandolin slicer for the best results). But potatoes in a pan with cold water. Bring to a boil and cook for no longer than 5 minutes. Drain the potatoes immediately being careful not to break them. Spray a stoneware tart pan with all natural cooking spray. Layer the potatoes in the dish, overlapping slightly. Sprinkle half the onions and garlic on top and season with salt and pepper. 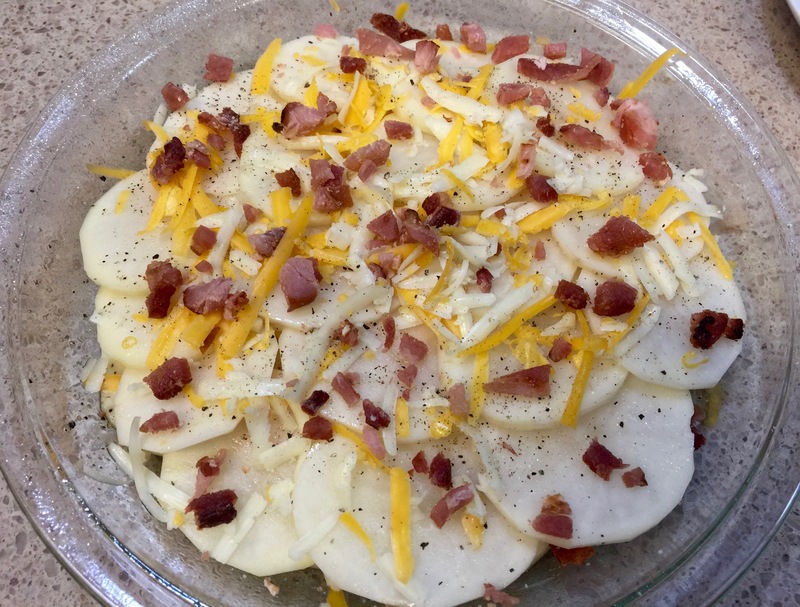 Cover the potatoes with half the cheese and sprinkle the top with half the bacon. Repeat with another layer. In a separate bowl whisk the milk and egg. Add some salt and pepper. Pour the mixture over the potatoes. Sprinkle with parsley. Cover and back for 75- 90 minutes or until the custard is cooked. Uncover and cook for an additional 10-15 minutes. Let rest for a few minutes before serving. 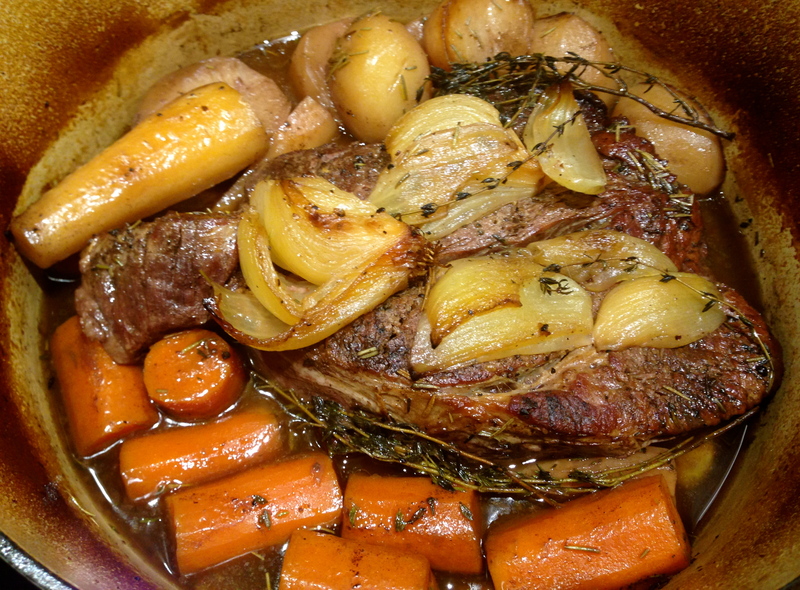 I know, I know, this is a pretty rudimentary recipe but I’m sharing it because the flavor is divine. 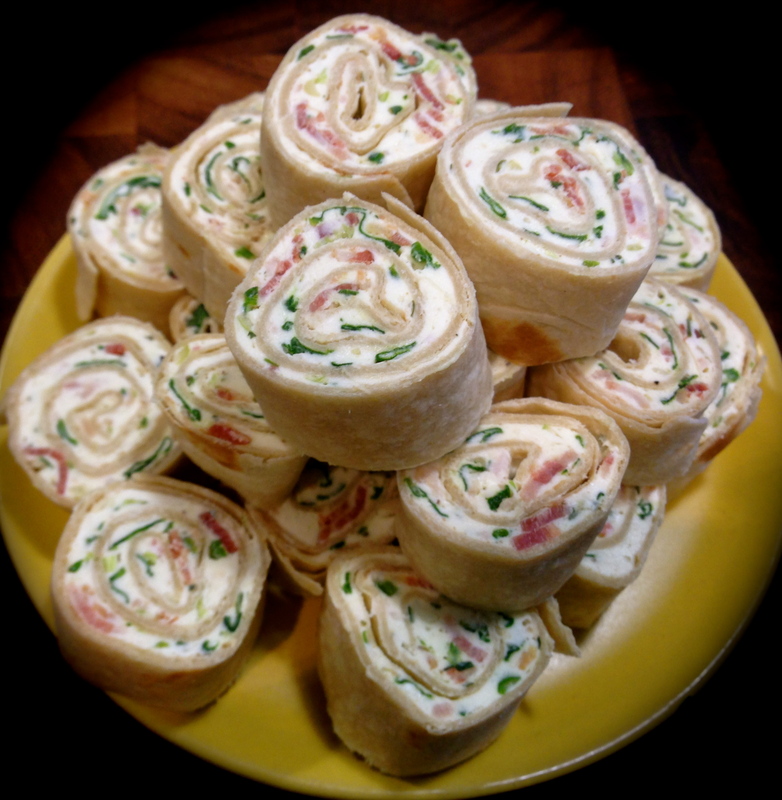 I’ve eaten many varieties of these pinwheels at parties and such and I have to say I like this version the best. 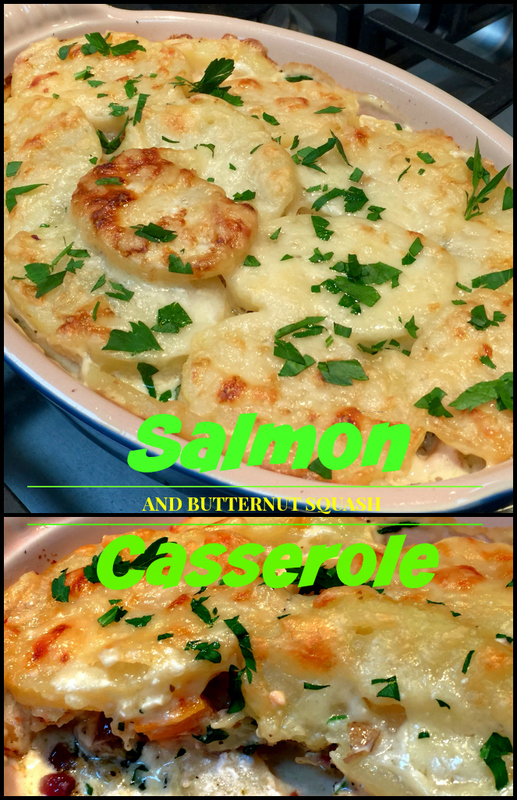 It is simple, easy to make and oh so delicious! 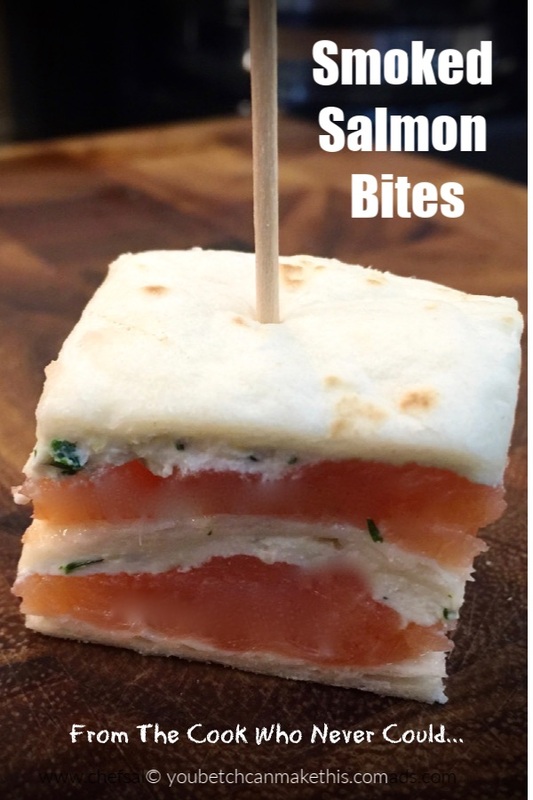 For those of you who’ve never made these before, (and I’m sure there has to be a few out there), there are a couple of tricks to making these that you really don’t think about the first time you make them – or at least I never did. 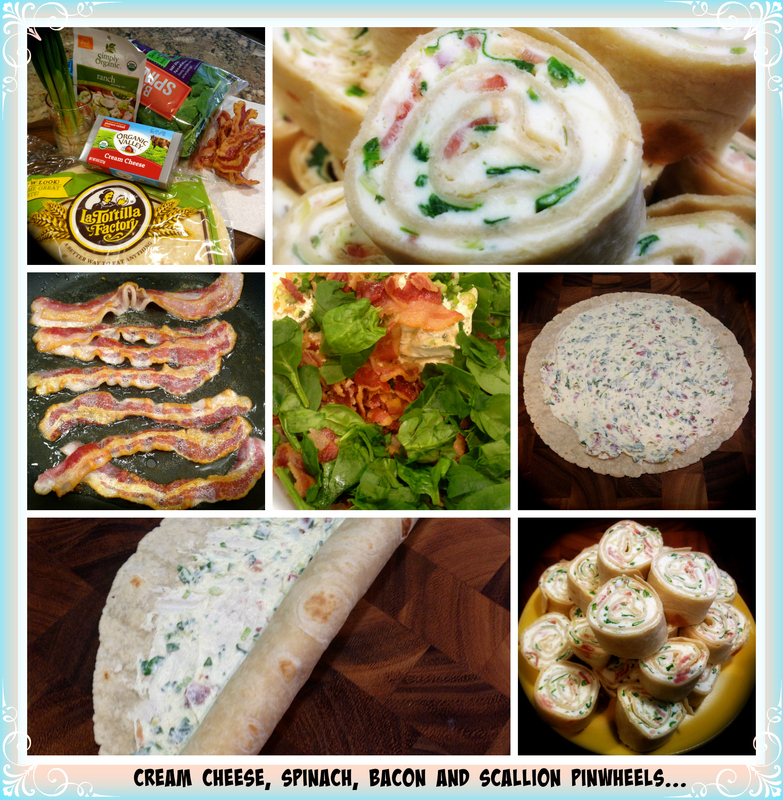 So for the burgeoning cooks who want to avoid some of my pitfalls, here are a couple of tricks to keep in mind for making delicious and good looking pinwheels. Lesson Learned 1 – The cream cheese must be room temperature: I think this is where many err the first time they make these. Keep in mind that you are spreading this mixture on a flour tortilla. If the cream cheese is not room temperature you will rip the tortilla to shreds. I took my cream cheese out of the refrigerator before I went to bed and then made the pinwheels first thing in the morning. 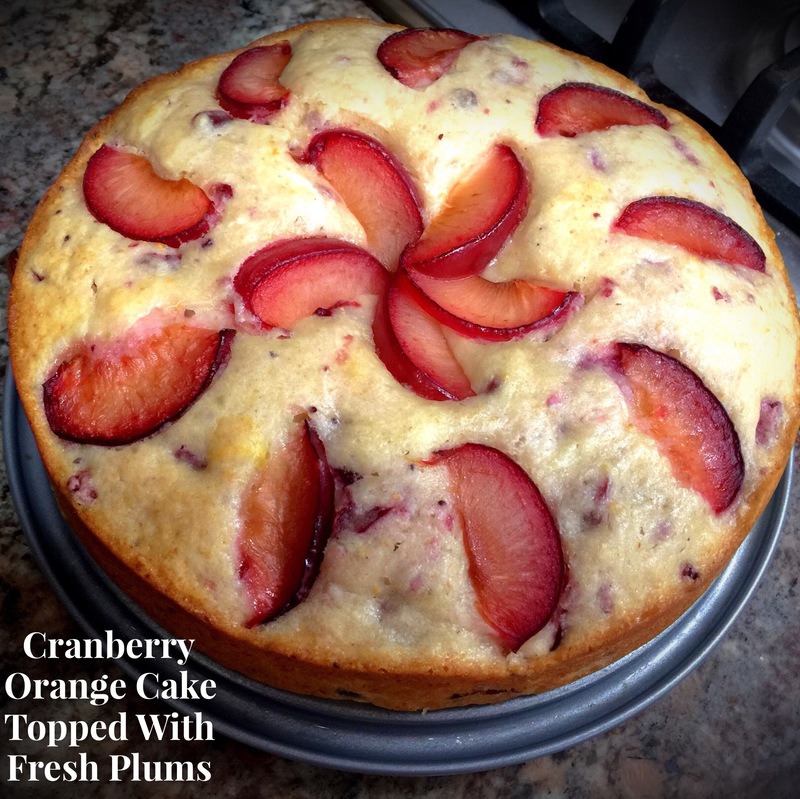 When the cream cheese is room temperature it not only spreads better but mixes better with the other ingredients. Make sure you give the cream cheese enough time to get to room temperature. Lesson Learned 2 – Heat the tortillas for 20-30 seconds in the microwave before spreading on the filling: Even though they are flour tortillas they can crack and split when you spread the filling on them and roll them up. Cover your tortillas with a damp paper towel and heat them slightly in the microwave. Only work with one tortilla at a time. Keep the others covered with the damp towel until you are ready to use them. Make sure the tortilla is not warm. Once you take it out from under the paper towel it will only take a few seconds for the warmth to dissipate but the tortilla will still be nice and pliable. I found that if you press your finger down on the top part of the tortilla while spreading the mixture, the process is easier and you don’t have the tortilla jumping around. Spread the mixture to within a quarter of an inch around the edge of the tortilla and even closer to edge that will be the end of your roll. That way you will have some mixture at the very end to act as a glue holding the tortilla closed. Lesson Learned 3 – Don’t put the mixture on too thick: If you put the mixture on too thick you’ll have a bunch coming out the ends. A nice even layer will do. I’ve found this particular recipe makes three large flour tortilla rolls. That may sound like a small amount but you get between 24-30 one inch rounds with this recipe. Keep in mind that the mixture is rolled onto itself so that creates the thickness you are looking for. You don’t need to create the thickness by overloading the tortilla. 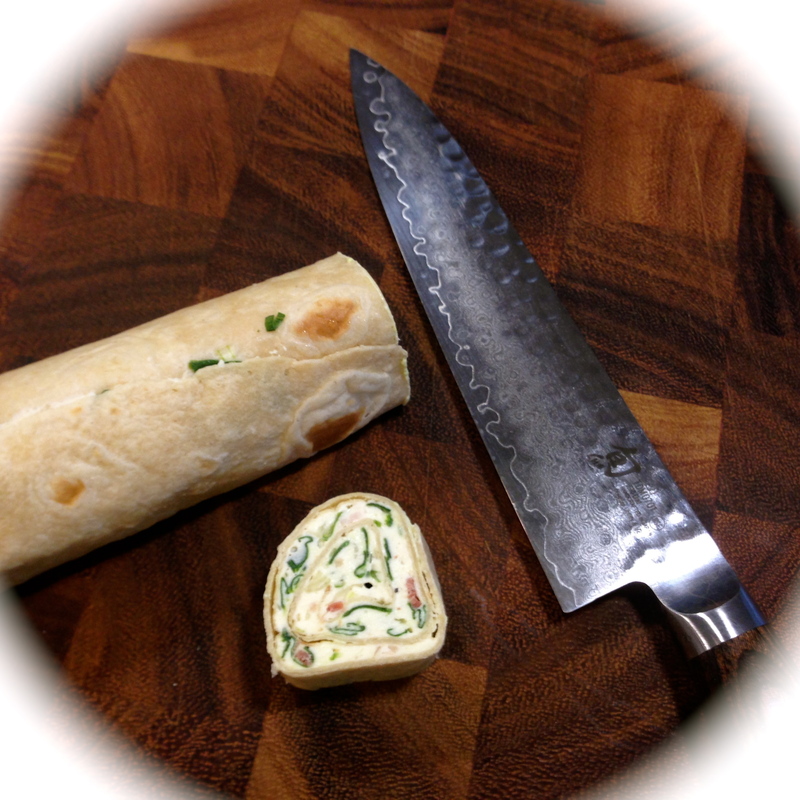 Lesson Learned 4 – Roll the tortillas tight: Start with a very tight roll and keep it that way throughout the rolling process. Once the tortilla is rolled, I recommend squeezing it lightly from top to bottom just to solidify the tight roll. You don’t want gaps in the filling when you cut them. Lesson Learned 5 – This is the most important tip of all – put the filled tortillas back in the refrigerator and let them chill for a few hours before you cut them: The first time I made these I cut the tortillas right after rolling them. Big mistake! Remember I said you have to work with room temperature cream cheese? Well room temperature pinwheels do not cut easily. In fact they become a gloppy mess when you try to cut them. 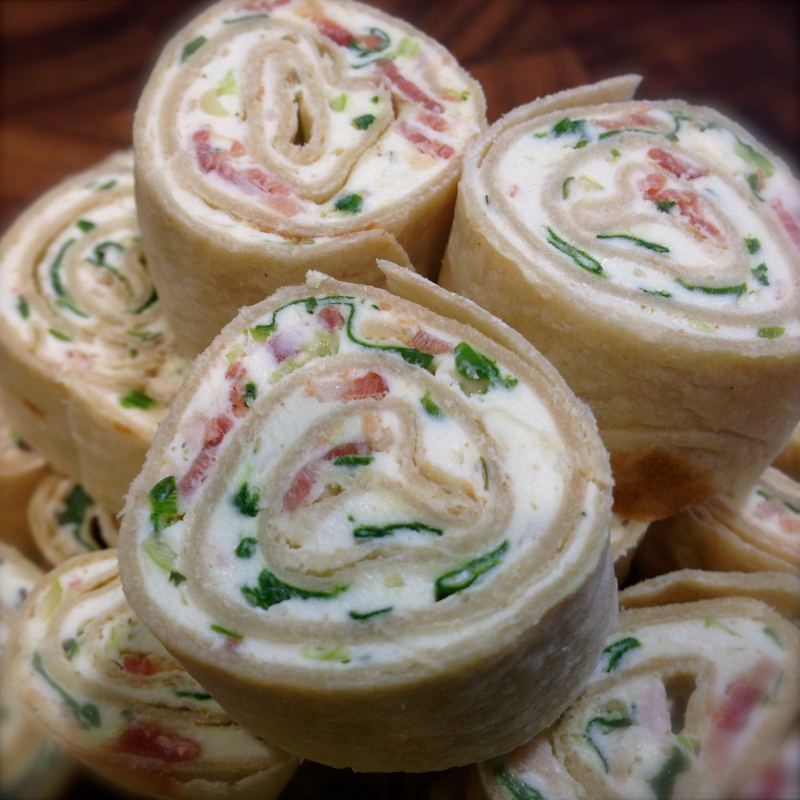 You need to let the cream cheese chill again to get cleaner cuts in the pinwheels. Plus it’s also good to let these flavors meld for awhile. Believe me, the mixture tastes great when you first make it, but it tastes even better when all the ingredients have time to get better acquainted. Lesson Learned 6 – When the tortillas have sufficiently chilled, use a very sharp knife to cut them: This is also important because the tortillas can still squish a little on you if you don’t use a sharp knife. You will find that you’ll have to cut a small portion off the ends of each tortilla and discard them. You just can’t get every bit of the tortilla filled. No worries, they make tasty morsels if you just want to pop them in your mouth. Also it is important to wipe off the blade of the knife with a paper towel when more than a small amount of cream cheese builds up on it. That way you will get nice clean cuts throughout. These are so easy to make and so worth it. My husband never had them before and he told me if any were left over after our party to be sure not to throw them out because he would eat them. “These are really good” was all I needed to hear from him to know I’d produced a hit. You can go online and find many different ways to make these. Hopefully these few lessons learned will help you avoid my mistakes when I first tried to make them. Make sure the cream cheese is a room temperature. Put the first five ingredients in a large bowl. Mix well with an electric hand mixer. Place the tortillas on a microwave safe plate and cover them with a damp paper towel. Microwave the tortillas for approximately 20 seconds or until they fell very pliable. Work with one tortilla at a time. Keep the others covered with the damp paper towel until you are ready to use them. Make sure the tortilla is not hot. Spread one third of the mixture on the tortilla making sure to come within a quarter inch on all edges and very near the edge that will be the end of the roll. Roll the tortilla as tight as you can. 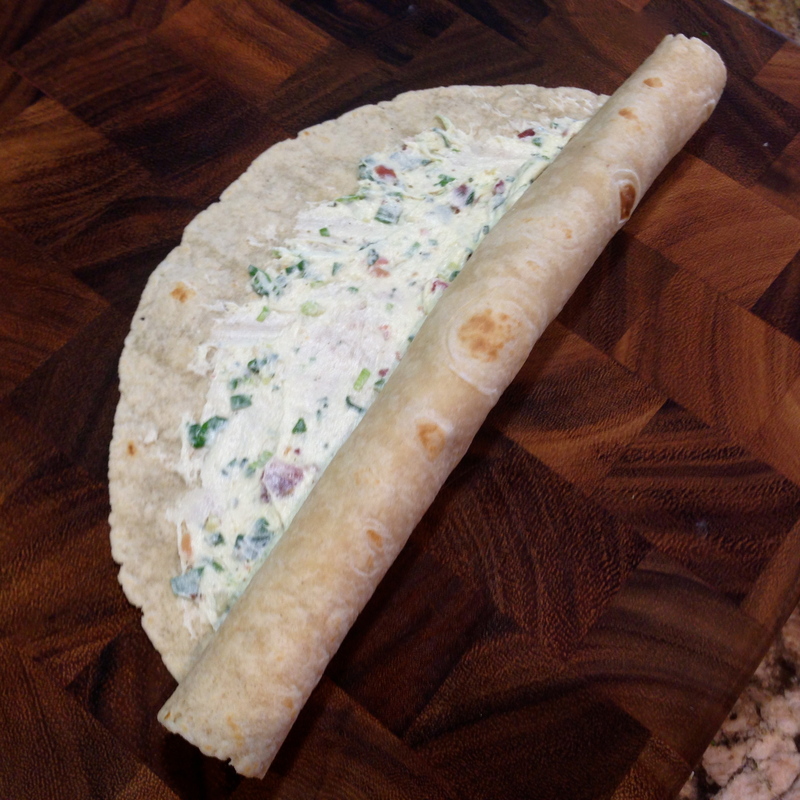 When finished rolling, gently squeeze the tortilla up and down the shaft of the roll to ensure the mixture is evenly distributed inside the roll. 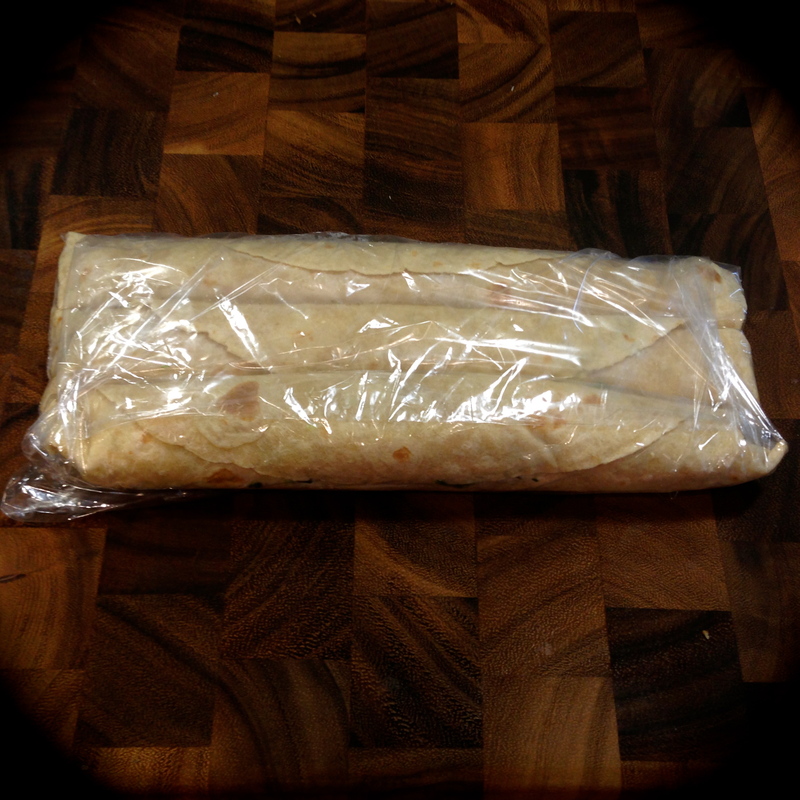 Place the finished rolled tortillas in a plastic bag and refrigerate them for at least 3-4 hours. When tortillas are sufficiently chilled, remove them from the bag and using a very sharp knife slice them into one inch rounds. Serve and enjoy!